As you may have realised by now, Totally Worth It as a series is as much about forgotten or unjustly maligned gems of tabletop wargaming as it is about the formative moments in my personal hobby life. So today I would like to address what may have been the defining purchase of my younger hobby years. 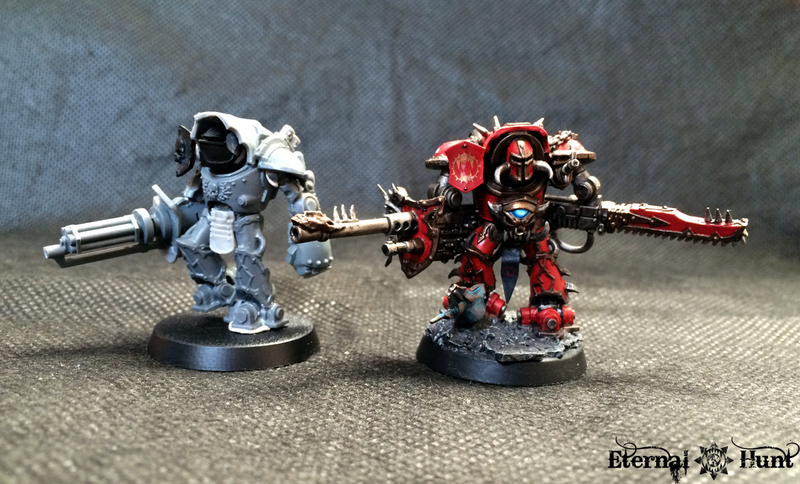 Today on Totally Worth It: The 40k second edition Codex Chaos. 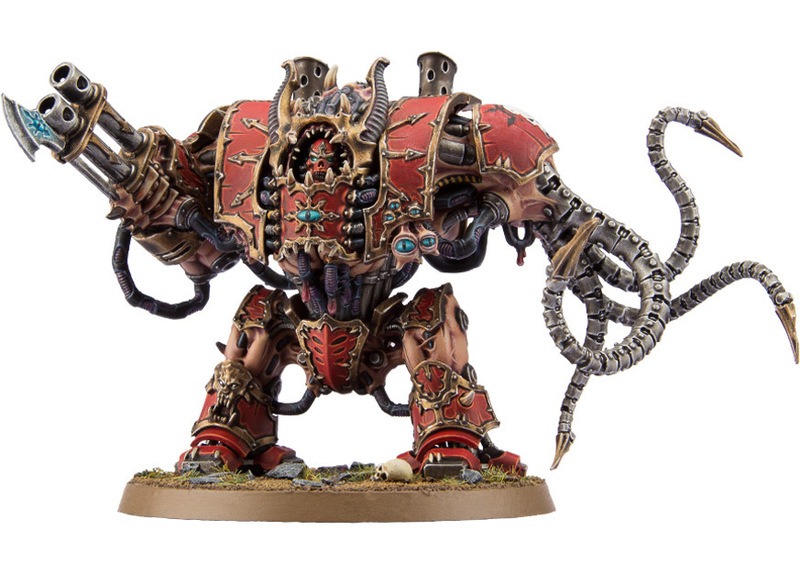 I remember seeing a picture of the model for Kharn the Betrayer and thinking: “I wonder what that guy’s story is!” I remember reading my buddy Phil’s 2nd edition Codex Ultramarines (in english, no less) and stumbling upon that scene where Marneus Calgar’s prowess in battle earns him a salute from a World Eaters champion and being fascinated by that idea, even then. 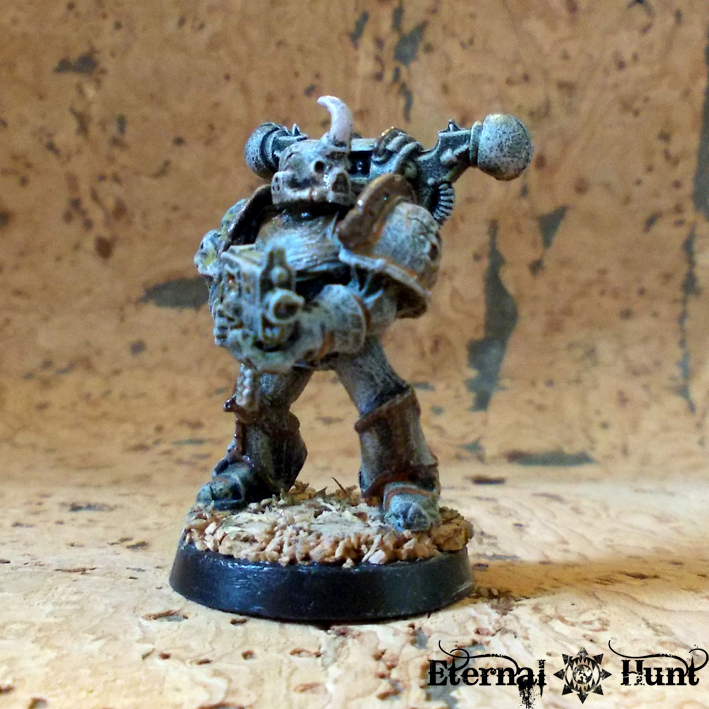 I remember discovering that there were such things as Plague Marines, the Thousand Sons, or Abaddon the Despoiler, but I knew the models long before I discovered their background or their significance in the lore. 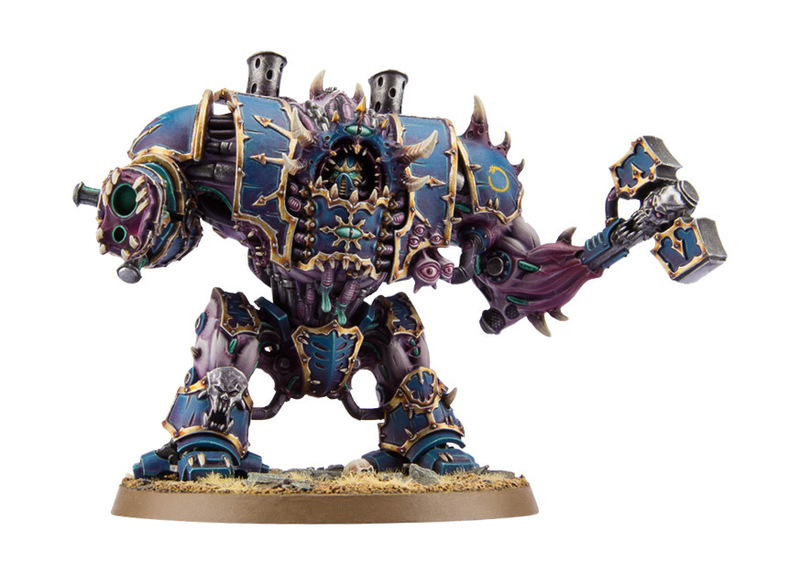 As a matter of fact, I would sometimes ask some of my buddies who had bought the models what those guys’ background was, and they’d shrug because they didn’t know. 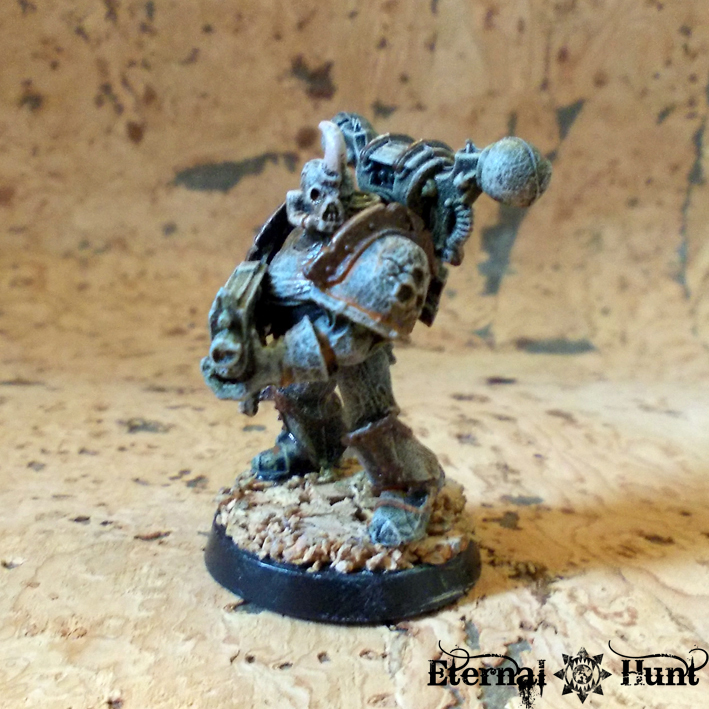 Back then, GW was following a policy of stripping down their Codices as much as they could for a while, making them as short and bare bones as they could be. That way, their reasoning went, they would be able to produce more of them in a shorter amount of time. They where right in this, but unfortunately, the books were worse for it. 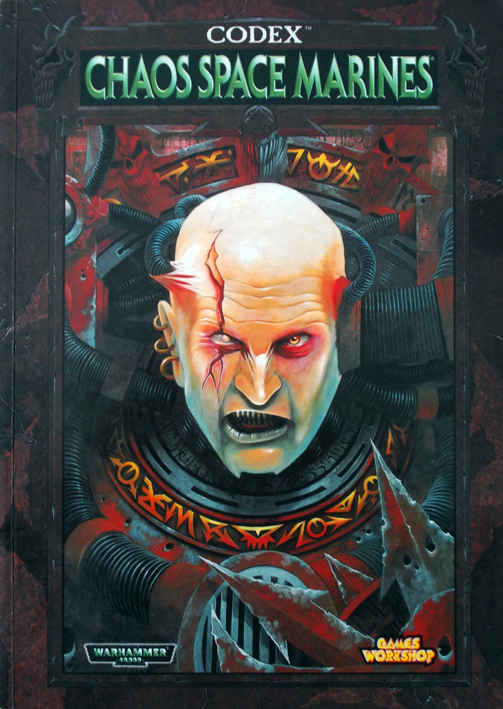 To wit: I had hoped the CSM Codex to be a great introduction to an army I was fascinated with, but it barely gave me a taste: Sure, it contained basic informations about the Great Crusade, the Horus Heresy and the fall of the traitor Legions, and I lapped it all up eagerly. 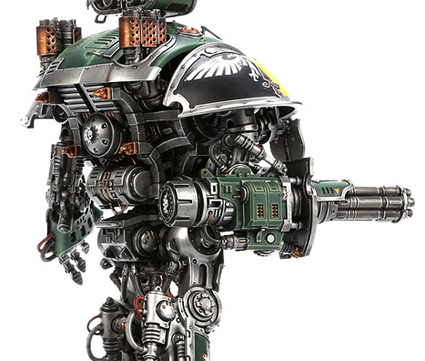 But it didn’t even begin to tap into the respective traitor legions’ rich lore. 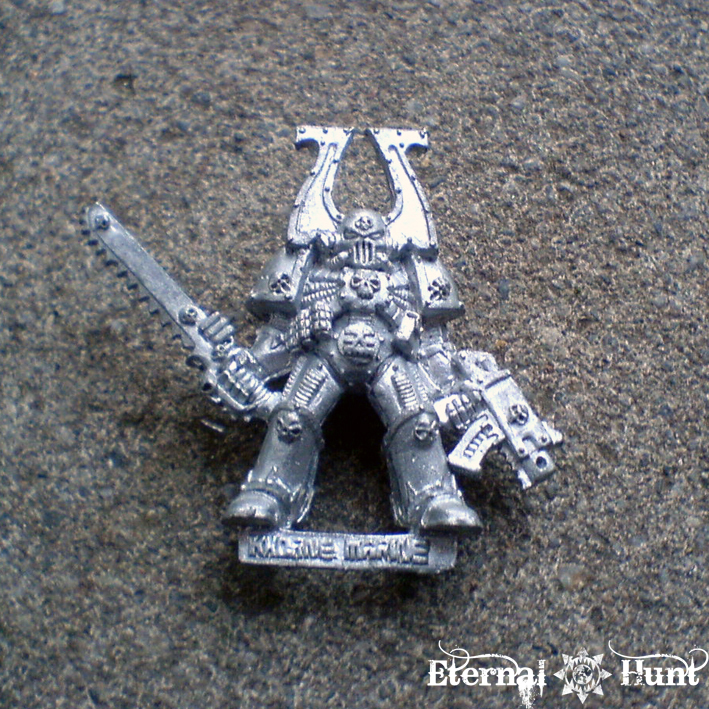 Even then, before all the HH novels, you just knew there had to be lots and lots of (potential) backstory to these guys: On a very basic level, they were just evil Space Marines, sure. But it went beyond that: They had rebelled. They had lost. They were 10,000 years old. What tragedy! What narrative potential! Unfortunately, the 3rd edition Codex barely gave one short column of text for each of the original traitor legions. And – I kid you not – they even forgot the Word Beareres altogether! And what artwork there was was so small as to be pretty much insignificant. 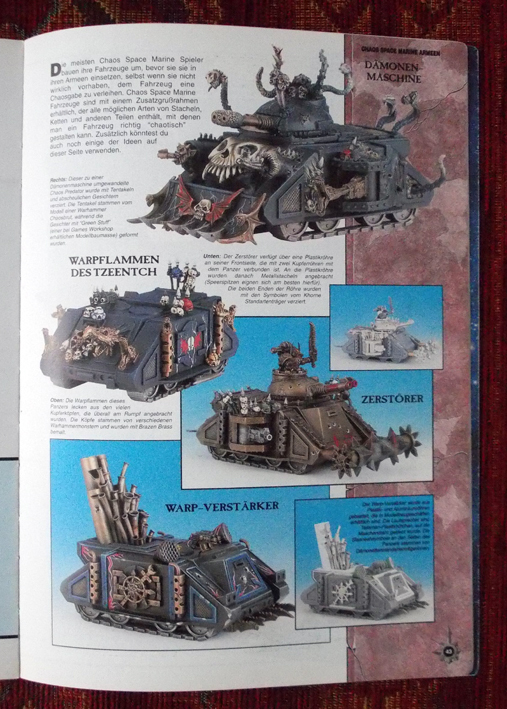 As a matter of fact, this may also be the only section of the book that actually hints at what a compelling faction chaos can really be, showcasing one of the greatest aspects of the army: its versatility and the potential for customisation and conversion. The rest of the book seems more like an Excel spreadsheet, though. And a general fondness for old wargaming publications notwithstanding, I feel that it’s probably the weakest CSM Codex ever. Anyway, I kept plugging away on my own for a couple of years, and then, one day, discovered a copy of the second edition Codex Chaos at a comic book store. 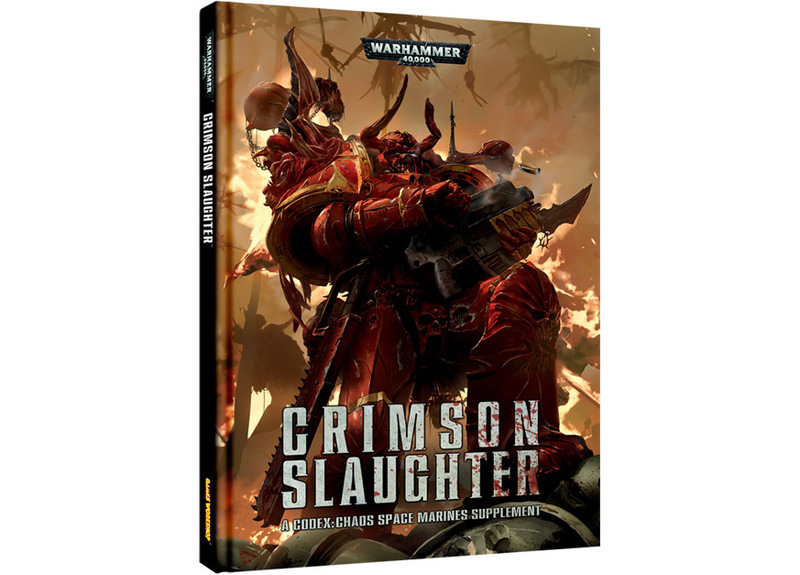 A quick glance made it clear that this was the book I had been pining for: Just skimming across the background for the traitor legions gave me more ideas and inspiration than the whole 3rd edition Codex. So I picked up the book in a heartbeat (and for a pretty penny, at that), hurried home and spent the next few days tugging into the background for my favourite 40k army. And with that, we finally arrive at our main subject, after a rather wordy introduction. After the meagre 3rd edition Codex, nothing could have prepared me for the 2nd edition book. 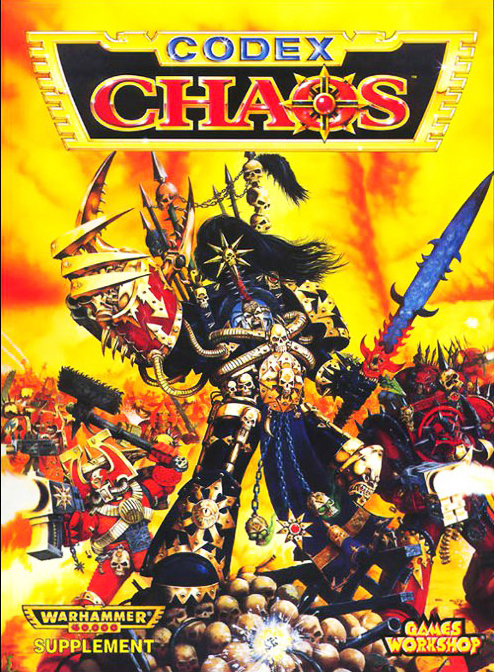 In fact, it still remains my favourite chaos army book ever. 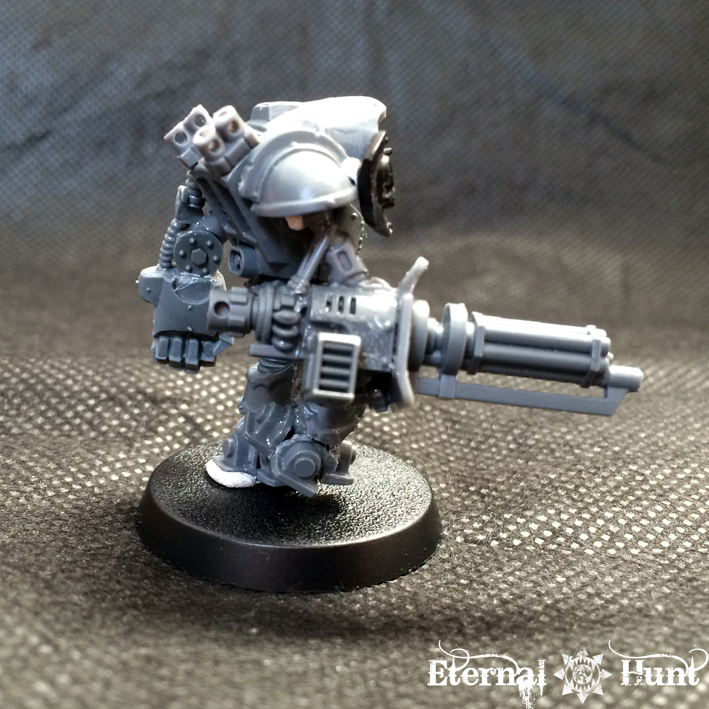 And even for somebody getting into the hobby today, it would still be an ideal place to get information on the traitor legions. 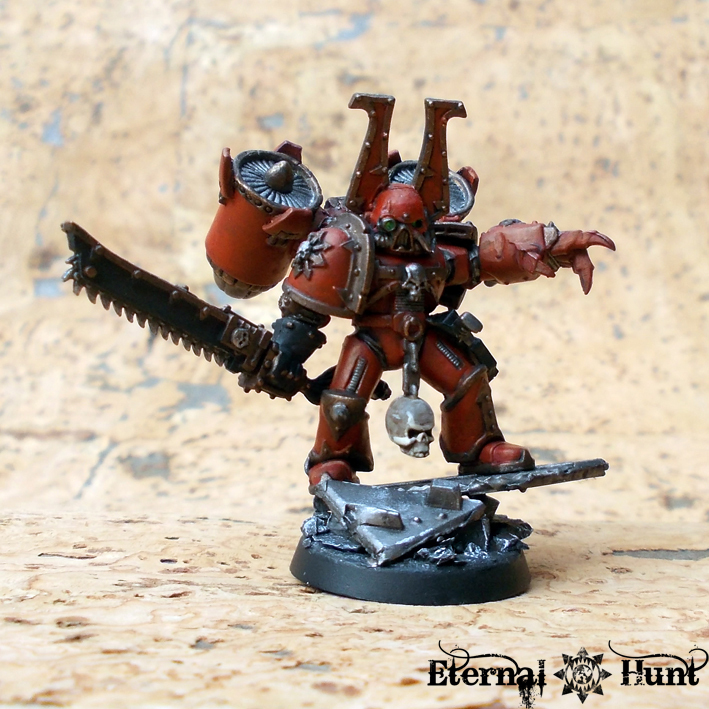 Sure, subsequent iterations of the fluff have added layers of complexity: The Word Bearers are a far bigger (and even more sinister) influence in the more recent material. 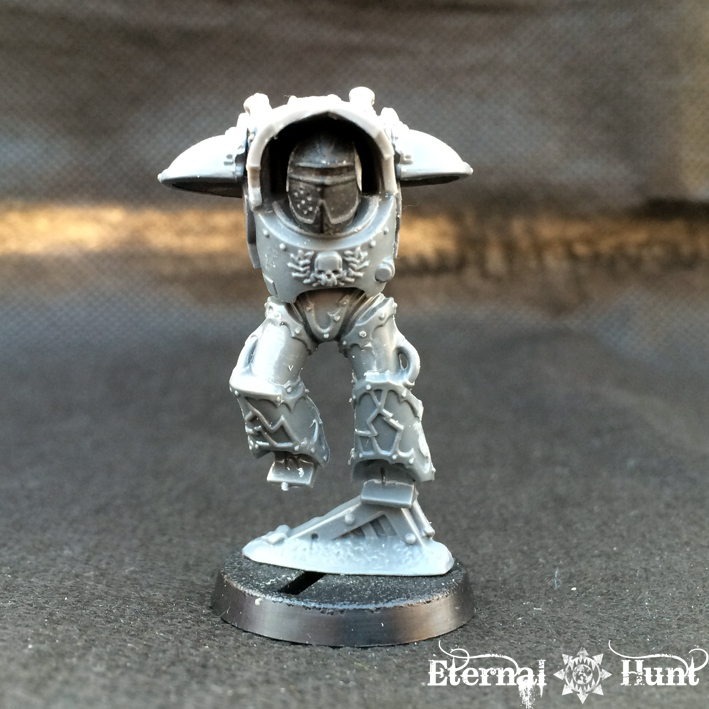 The Alpha Legion’s allegiance has become far more ambiguous. But reading through the material in the codex still gives you a compelling and completely viable rundown of the traitor legions. And all the backstory and narrative potential isn’t merely being obliquely hinted at. Of course it helps that the book is lavishly illustrated, featuring brilliant artwork by such luminaries as Mark Gibbons, Wayne England and, of course, John Blanche himself. 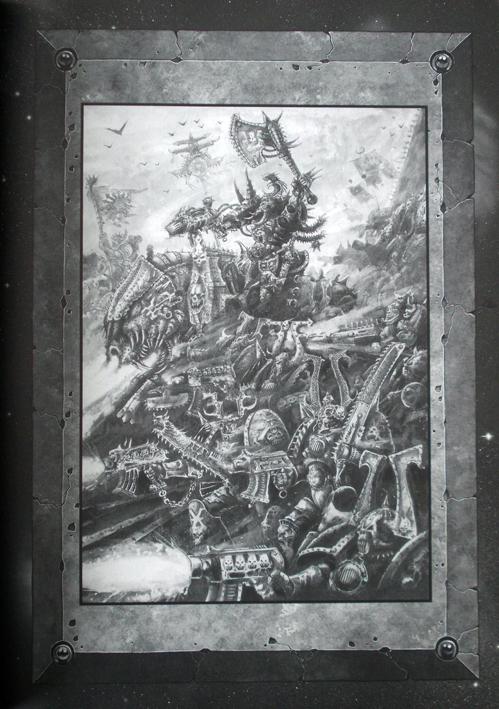 Did you know JB actually did some World Eaters artwork at one point? Two pages full of crazy conversion and customisation ideas. 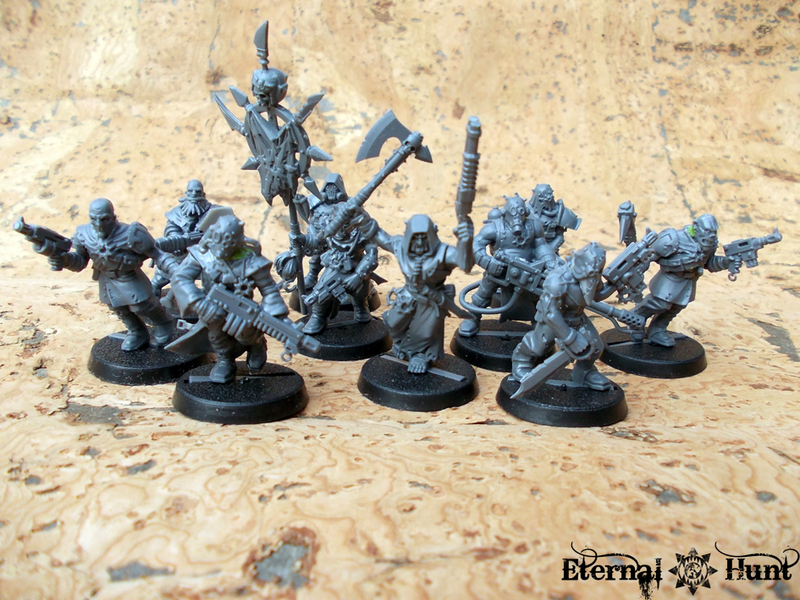 And even though none of the bitz mentioned may be available any longer, this spread instantly tells you what building and painting a CSM army is about: It’s about giving it your all to make sure your legionaries actually look like the 10,000 year veterans they are! 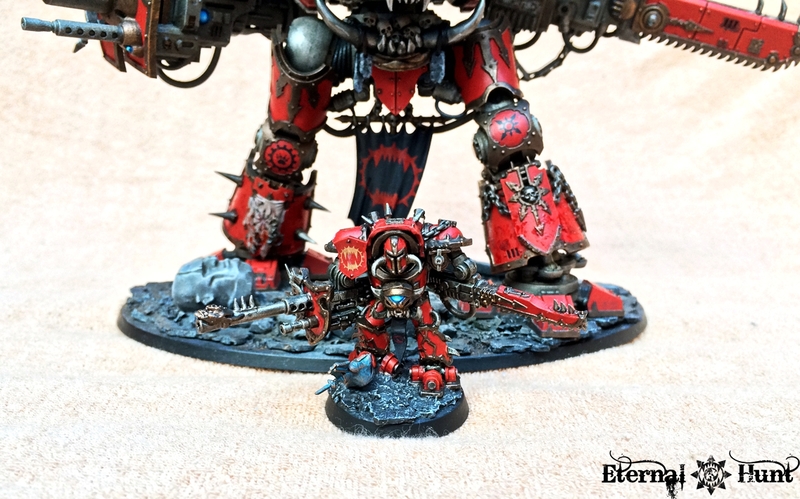 It’s about tweaking each model and going the extra mile, to end up with an army that is truly special and unique! 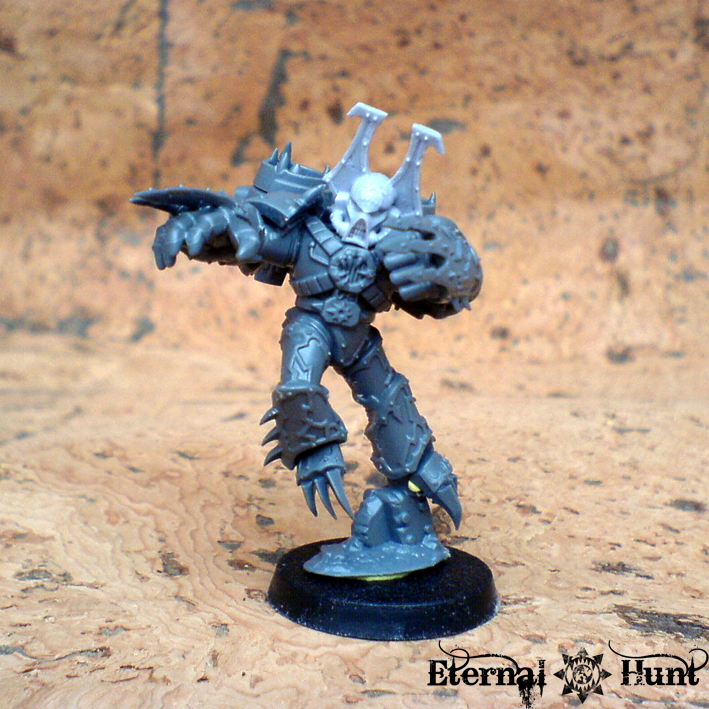 And, of course, there’s also advice on how to customise and convert your chaos models. 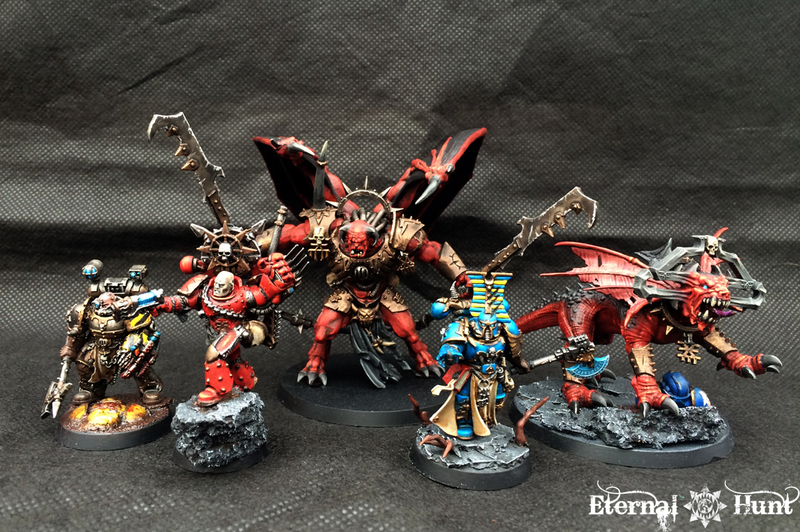 This nicely complements John Blanche’s ideas, and I am still rather fond of some of the conversions shown in the 2nd edition Codex, even though miniature design has come quite a long way since then. 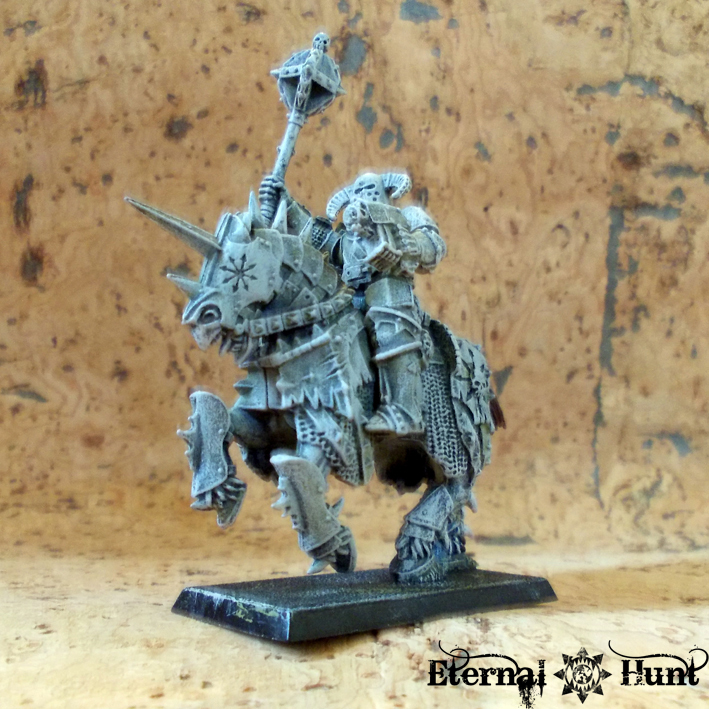 It’s also worth mentioning that there are no more conversions in today’s codices, which I think is a crying shame! 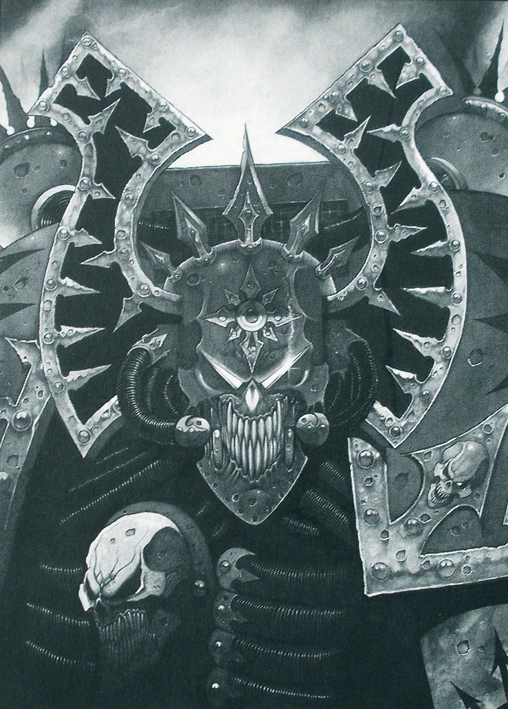 The book continues with an in-depth look at the most notorious champions of chaos, introducing characters like Abaddon the Despoiler, Kharn the Betrayer, Ahriman of the Thousand Sons and Fabius Bile. And it has to be said that some of the artwork featured in that section not only managed to blow me away back then, but is just as impressive today. 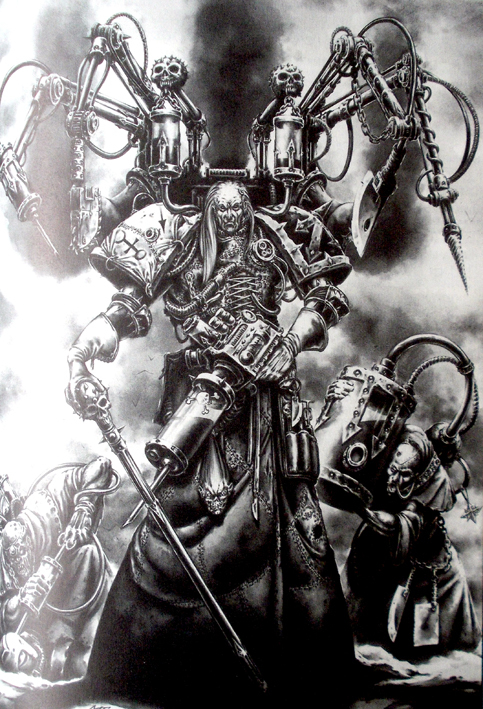 Check out this piece of artwork depicting Fabius Bile. Best version of the character ever, if you ask me! 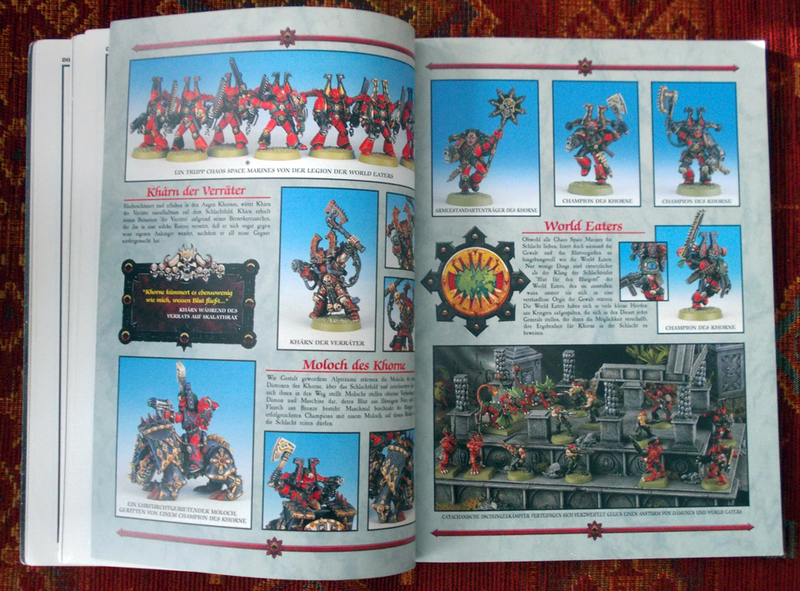 And there’s more: A huge wargear section, not only featuring the rules for the different items but also containing interesting tidbits about the state of technology at the time of the Great Crusade (sadly, this – along with the rules section – is one of the parts of the book that have been invalidated by the newer fluff and material). 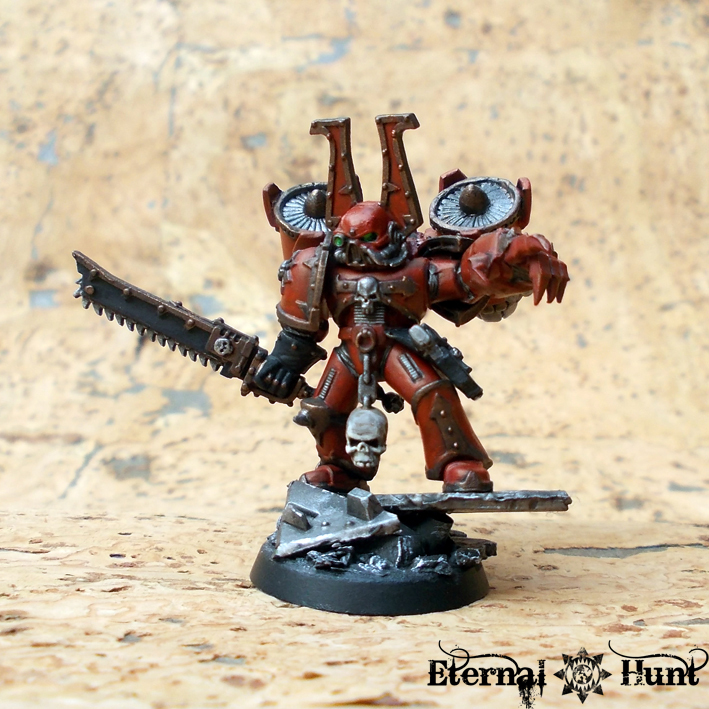 A section about traitor chapters of the Adeptus Astartes, featuring the notorious Red Corsairs and – for the first time – their Lord, Huron Blackheart. There’s also a chunk of background about the Fallen Angels and Cypher. 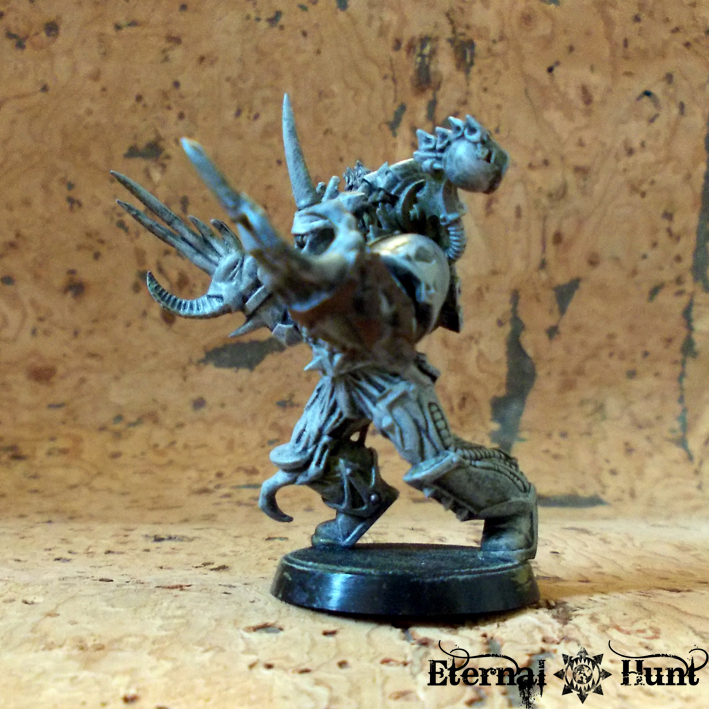 The book just goes on and on and lets you discover a thousand different and cool details about the servants of chaos. Certainly one of the greatest things about the book is its sizeable appendix, though, providing you with rules for chaos cultists and traitorous planetary defense forces. 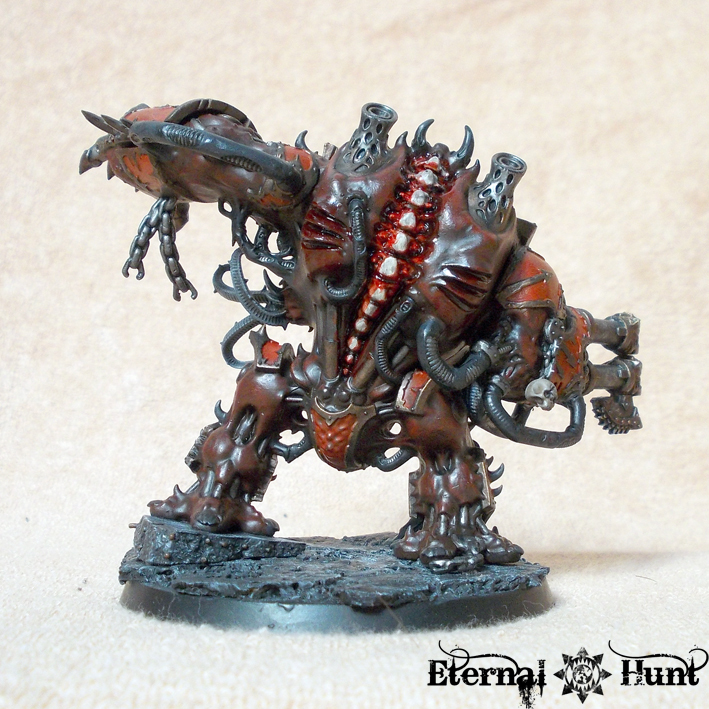 And it even gives you rules for daemon world armies, eternally waging war in the Eye of Terror. 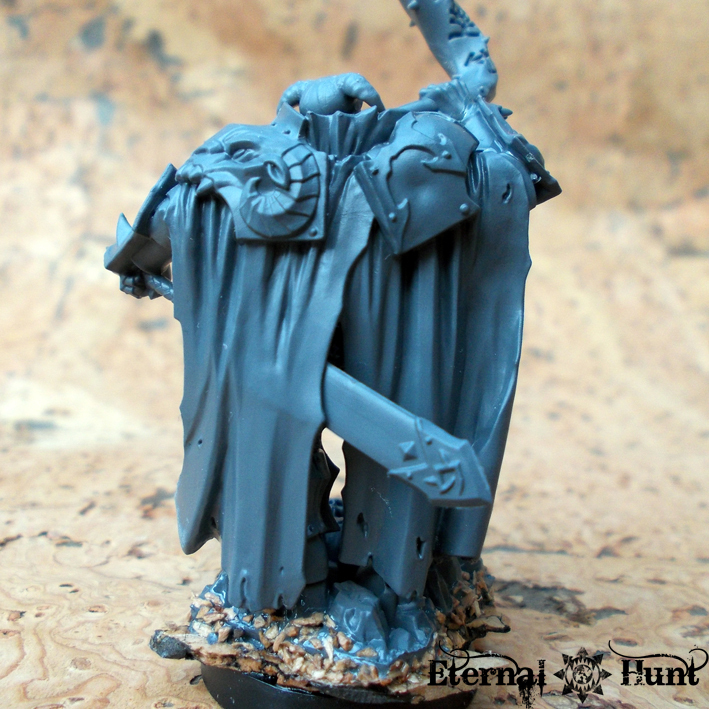 This effectively allows you to use parts (or indeed the entirety) of your WFB chaos army in 40k games to represent the twisted armies of the Eye — a nice callback to the blending of WFB and RT that occured in the “Realm of Chaos” books of yore. 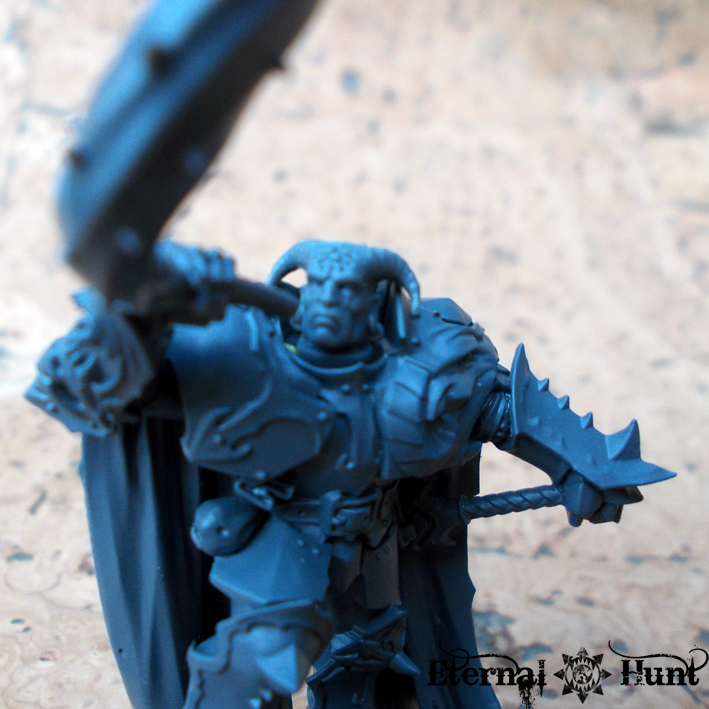 The section also gives you information about the great four’s original daemon princes, along with corresponding rules. In fact, this section is a perfect representation of what’s so great about the book in the first place: You get the feeling that Jervis Johnson and Andy Chambers just decided to throw in every cool idea they had, and to make as comprehensive a book about the ruinous powers as they could. Some of the rules may be experimental and unbalanced (in fact, the authors even specifically point this out with regard to the appendix). Some ideas may seem goofy nowadays (and, in all fairness, they were probably just as goofy back then). But the book is clearly a work of love, and that fact shows through on every page. Even the very last page of the book is used by the authors to impart yet more ideas for narrative games involving the forces of chaos. You cannot help but violently fall in love with a design philosophy like that! 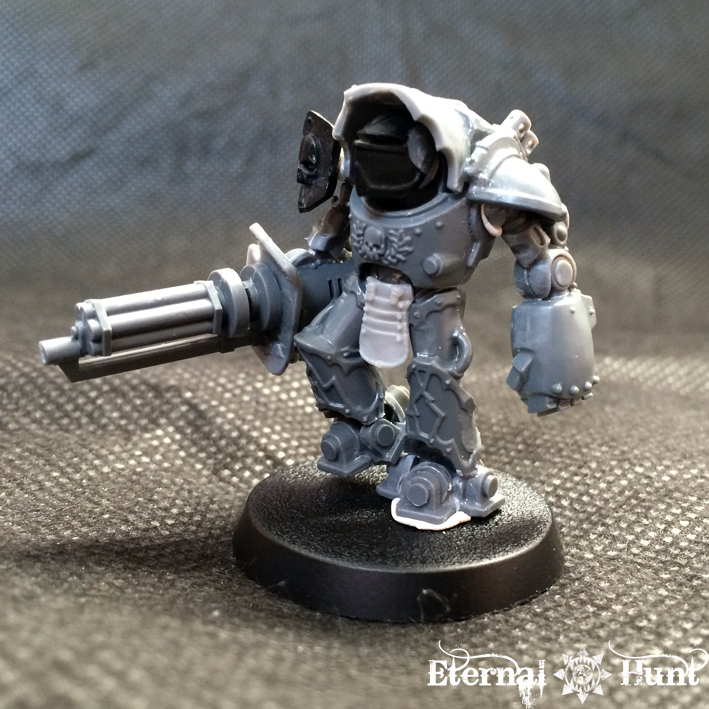 So, where does that leave us in regard to the versions of the CSM Codex that came afterwards? 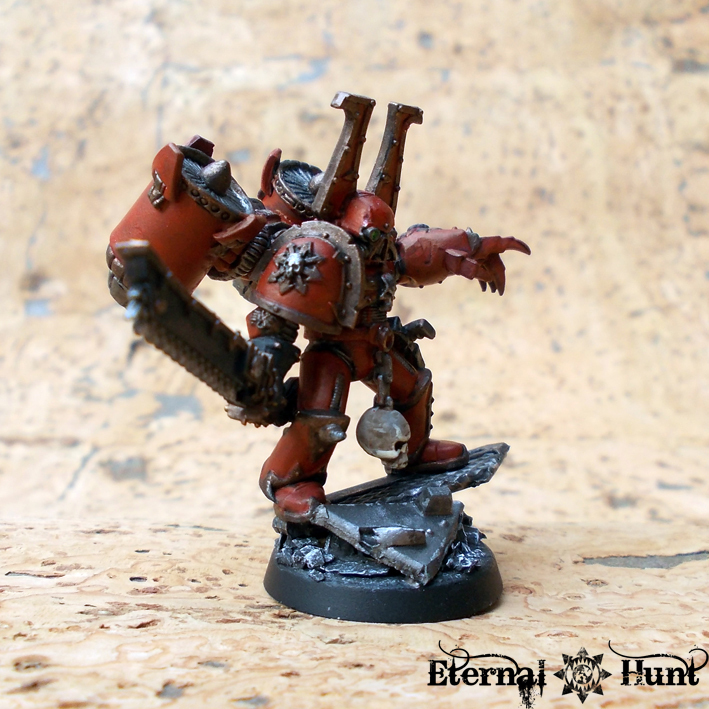 As you may have gathered, the less said about the 3rd edition Codex, the better. 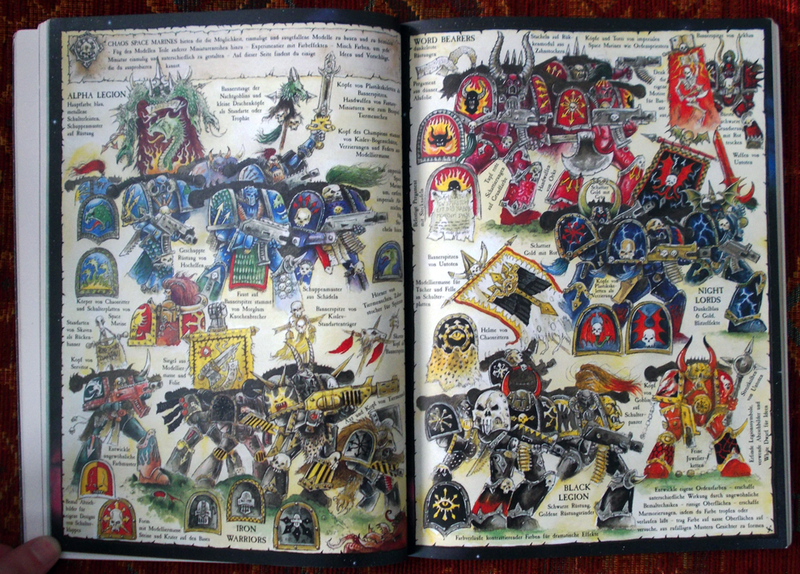 The fabled “3,5 Codex” still stands tall as a fan favourite, because it allowed players to play each chaos legion with its own custom rules and wargear — however, this came at the price of making chaos armies somewhat unwieldy and frankly impenetrable for non-chaos players. 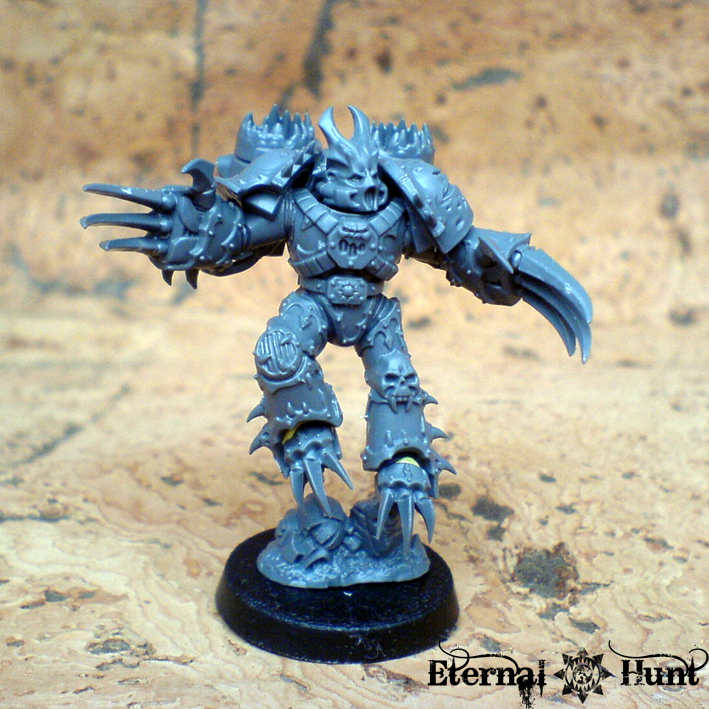 The oft-maligned fourth edition codex, derisively called “Gav Dex” by some, went for a far more streamlined solution, alienating quite a few players along the way. 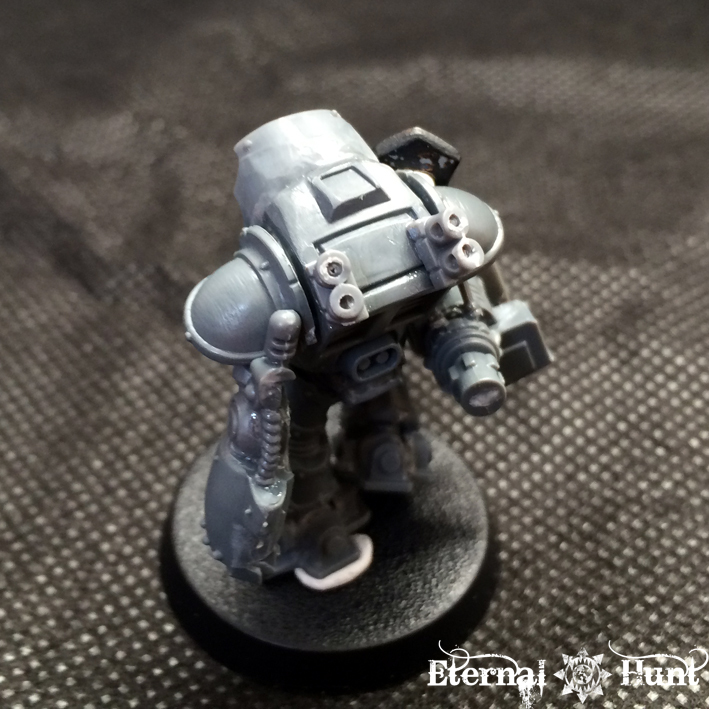 Personally speaking, I rather liked the codex for its flexibility, and I think much of the criticism leveled at its authors is actually rather unfair (you can read my thoughts on the matter here, in case you are interested). 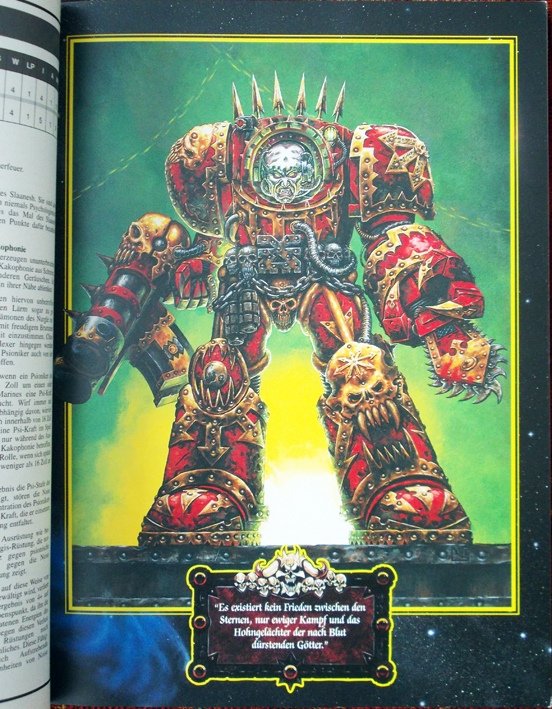 And the sixth edition codex? I like the book: It has great production values, and the rules set seems robust enough while retaining the flexibility of the last edition’s codex. But the legion specific background is back to one short column per legion, and that’s certainly not an improvement. 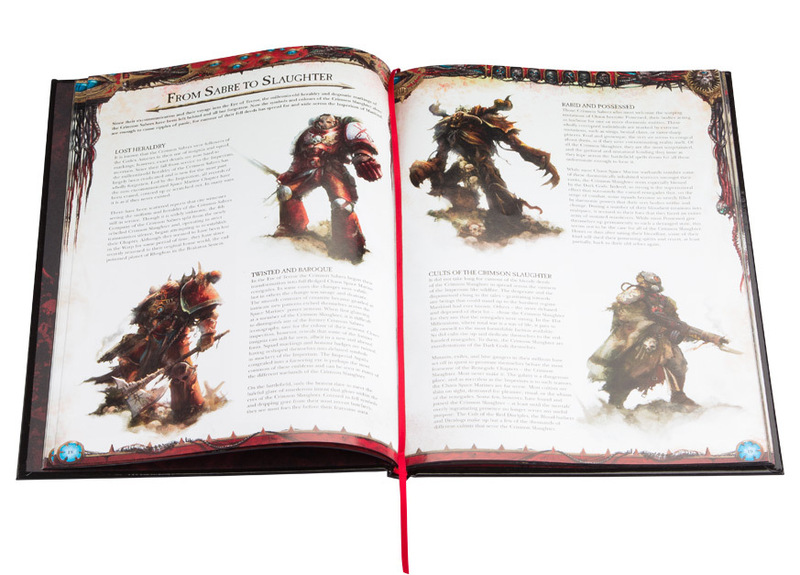 In all fairness, giving chaos players a book they are actually happy with may be an unsolvable task: A Codex to make every chaos player happy would probably have to be 500 pages long, feature full rules for each and every legion (and, as a consequence, probably cost 250 Euros). So I think Phil Kelly’s effort was probably the best possible compromise. The situation today is also far different from that in the mid-90s: With places like Lexicanum and the 40kWiki and publications like the BL novels available, you have all the background you might need at your fingertips at all times. 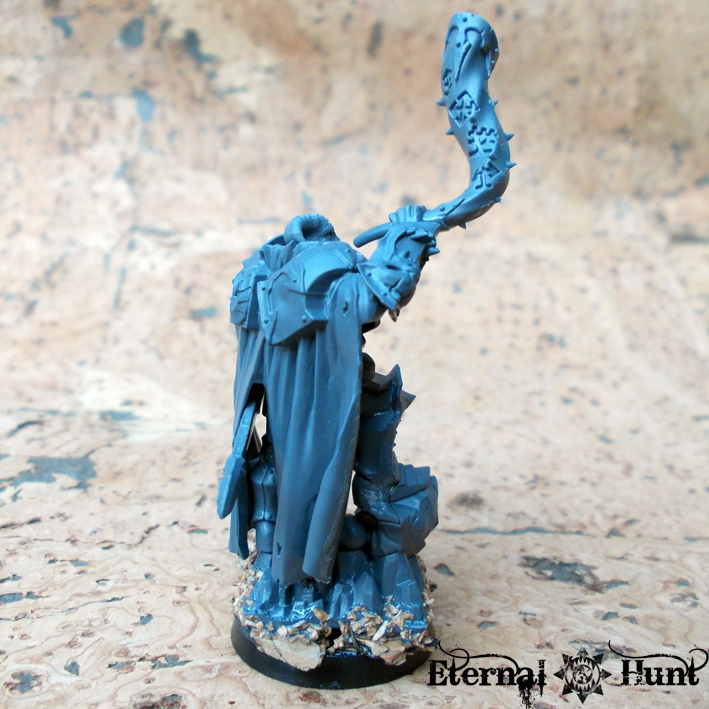 There’s also a huge online community of hobbyists to discuss the background and fluff with. So today’s codices may actually no longer be requird to be the be-all and end-all when it comes to describing the background. 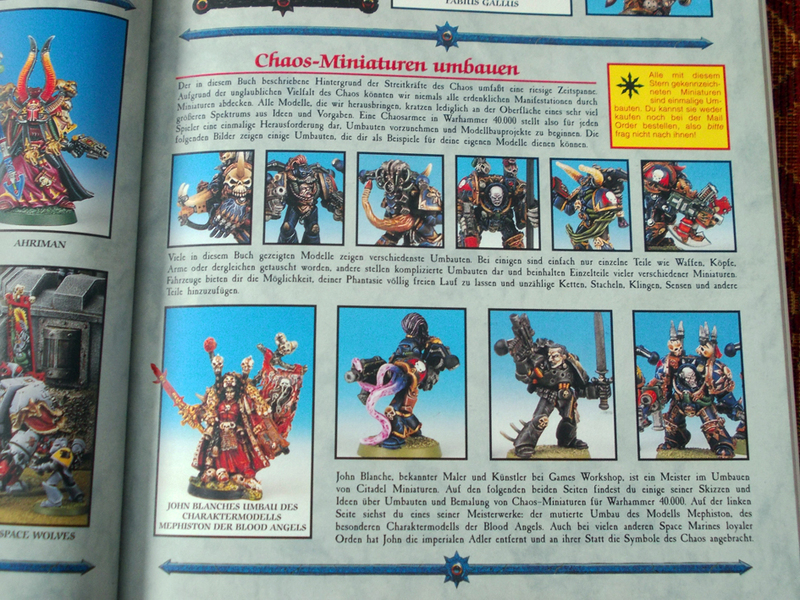 Still, the 2nd edition Codex Chaos still stands as possibly my favourite chaos army book ever. It delivers a fantastic amount of bang for the buck and is still just as good an introduction to the traitor legions now as it was back then. And even though the rules are no longer viable, the book is still a great puchase, just for the background section and the crazy amount of ideas on display! So if you’re a chaos player, and should find yourself in any position to pick this up, go for it: It’s still totally worth it! 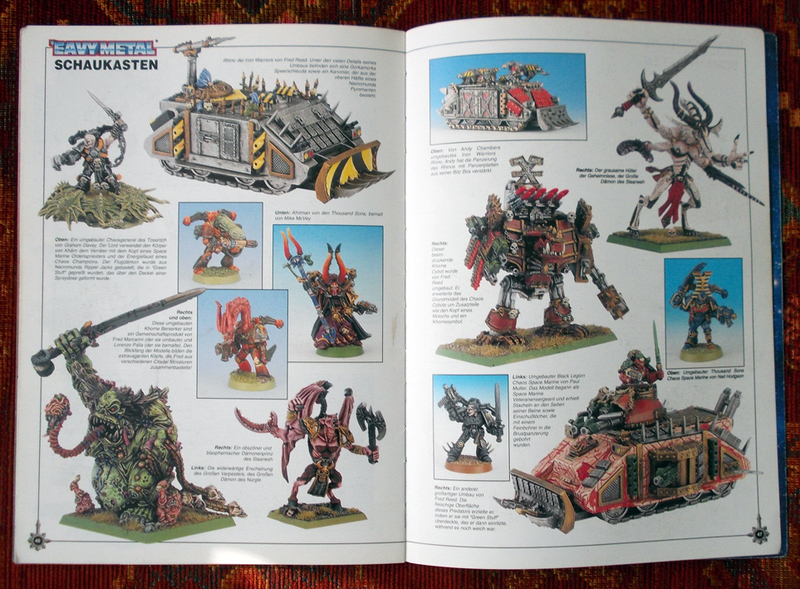 So yeah, that was my rather wordy – and probably completely inadequate – love letter to one of my favourite GW publications ever, I guess. Provided you didn’t fall asleep in the first place, should you have anything to add regarding the book, or any feedback to this review, I’d be happy to hear from you in the comments section! And, in any case, thanks for looking and stay tuned for more! 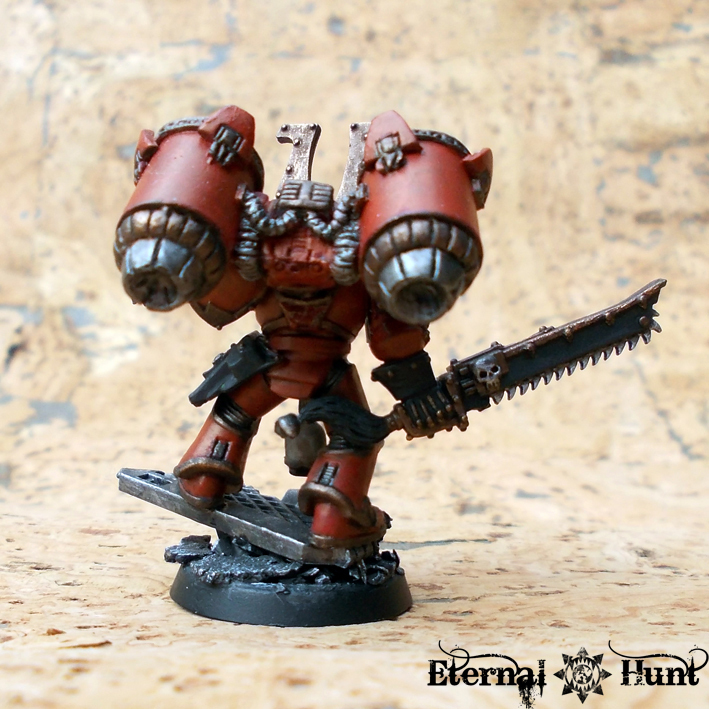 Granted, here may be other units in the list that are more viable in the fast assault role (*cough* bikes *cough*), but I simply love the concept of World Eaters equipped with jump packs rushing into the thick of battle with wild abandon. 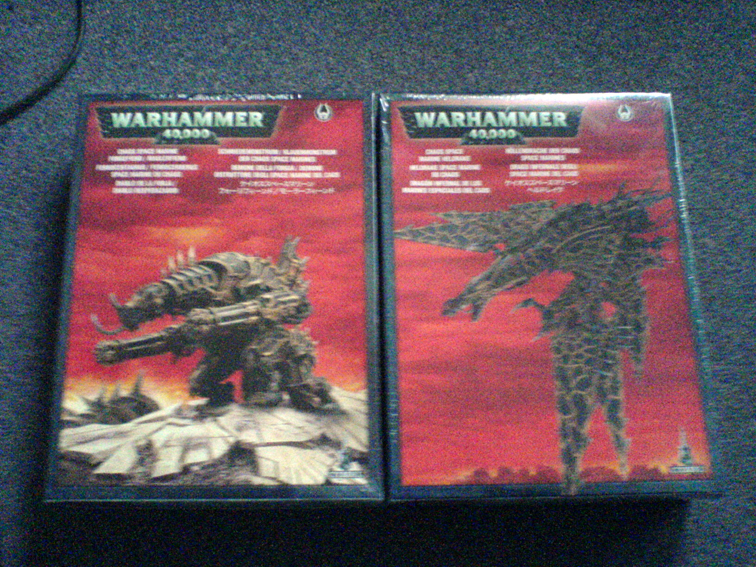 So it is probably no surprise that a box of the new plastic Raptors/Warp Talons was one of my day one purchases, along with the new Codex. Today’s post will be all about those guys. The kit has been out for a while now, so I will spare you the unboxing video and sprue diagrams. Both are easily found elsewhere on the net. Indeed, let me point you towards Screwed Up Dice‘s very nice, two part review of the kit for all the necessary information. 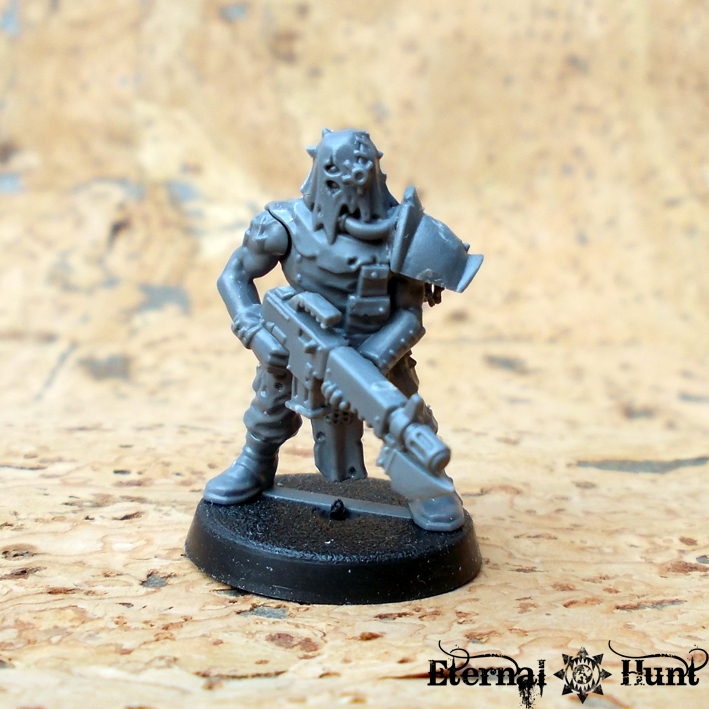 Still, late as my own “review” of sorts may be, I thought it would be nice to collect my thoughts on the models while working on my first new squad of jump infantry, pointing out the good and the bad as I go. Working with GW’s excellent and highly versatile plastic kits is always a joy, and that is why the mere fact that Raptors are now available as a plastic kit counts as a huge advantage in my book: No more pinning, no more models falling over because they are precariously balanced on their bases. And lots and lots of customisability — provided you know how to use a knife, that is. 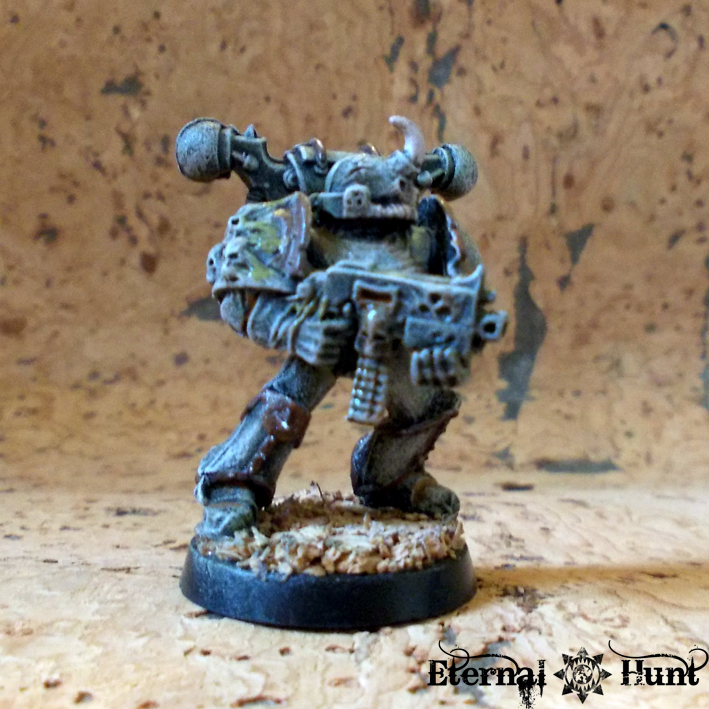 I have painted quite a few metal miniatures in my time, and I like the amount of detail GW’s designers are able to cram into some of those Finecast models (QA problems notwithstanding), but plastic is where it’s at for me! 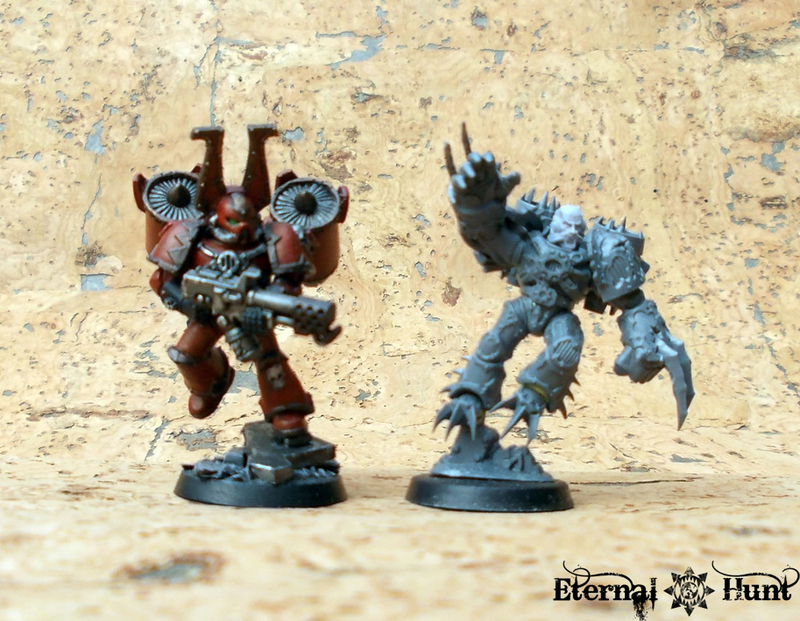 The sculpt on these guys is pretty great, but that’s almost a given with GW’s more recent kits. 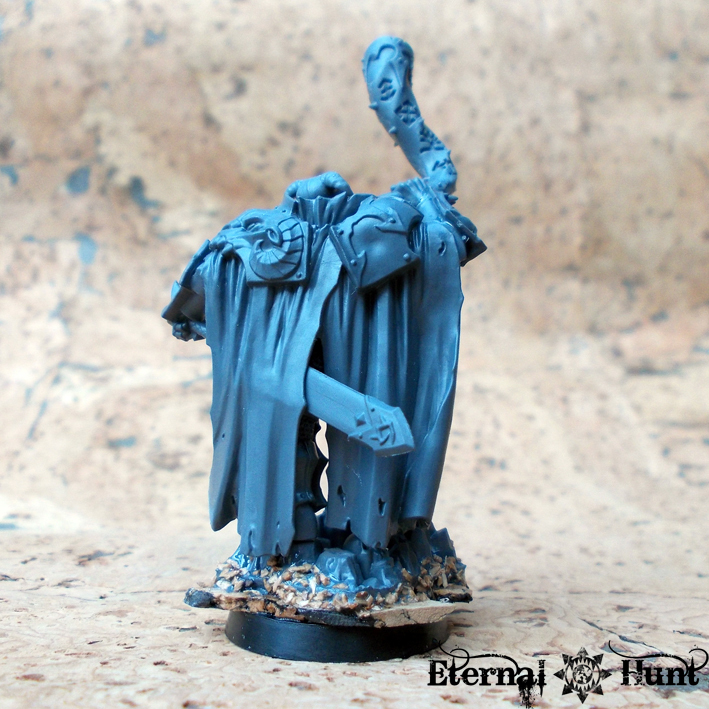 What I really like though is the slightly readjusted overall look of the models: The last Raptor sculpt – along with the fluff – had them positioned as a bit an external force to all Traitor Legions, a cult onto themselves, which meant that the models had a very distinct look. 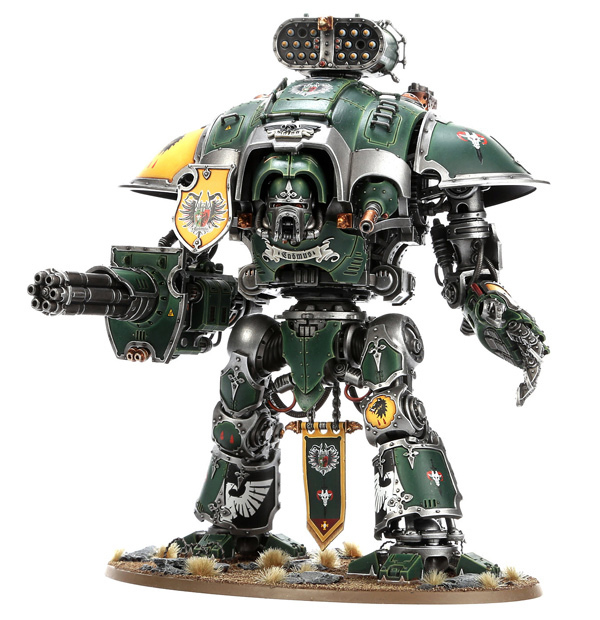 And while more individuality is mostly a good thing, not everyone was happy with their Raptors looking so different from the rest of their force: Even when painted in the colours of a specific legion, they never quite looked like they belonged. 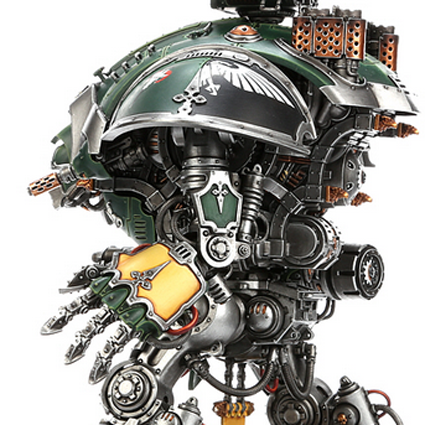 The new armour design seems like a bit of a return to the original 3rd edition Raptors in that it is distinct enough to differentiate them from other unit types, but should also work rather well with different colour schemes, those of the original Traitor Legions included. So for those who want it, the individuality is still there, while the rest of us are free to build jump infantry that resembles the rest of our force. 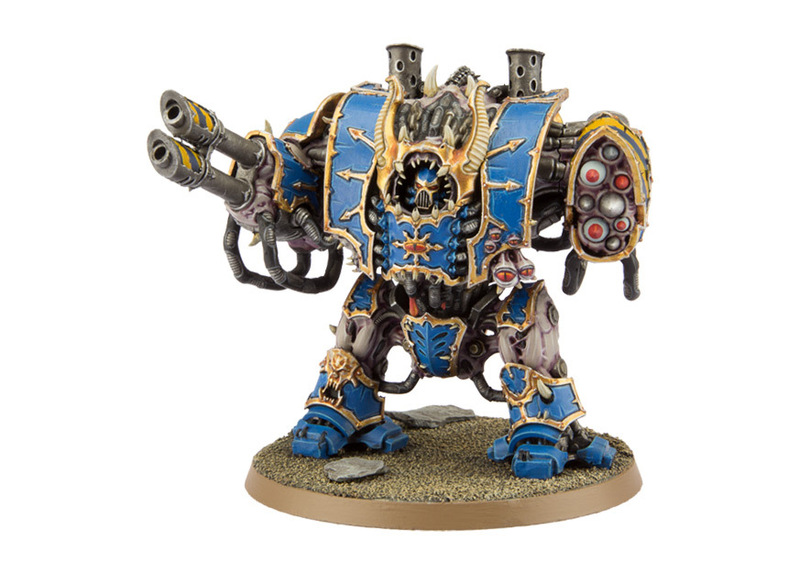 As an aside: While, as a follower of Khorne, I loathe all Slaneeshi dogs with a passion, those shoulder pads and helmets with the speaker-like design should work really well for kitbashing Noise Marines. It’s great to see that the kit comes with a full set of weapon options for the Raptors: No more scrounging around for extra Meltaguns or having to use the same old weapon bit over and over. 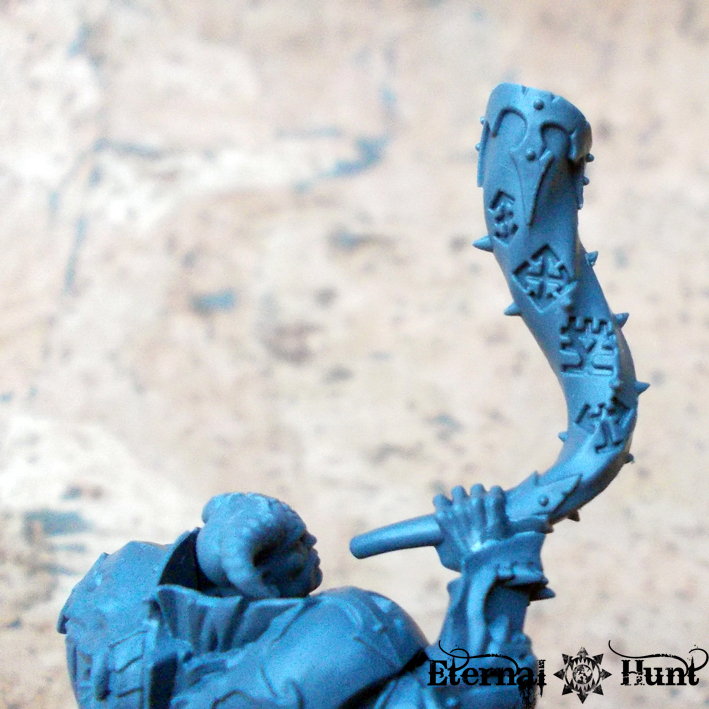 All of the weapons are very nicely detailed and have a distinct chaos look. 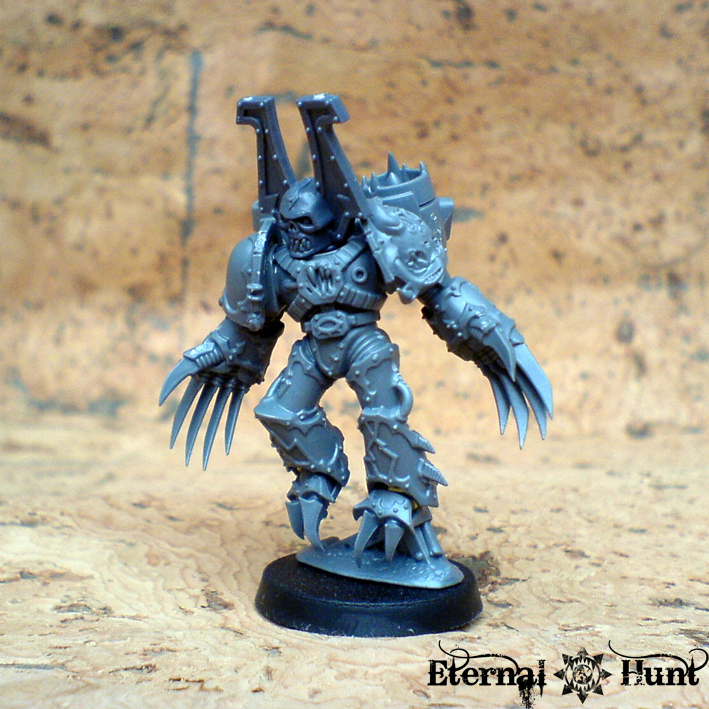 The same goes for the Warp Talon claws (which could also be used as Lightning claws on regular infantry champions, Chosen etc.). 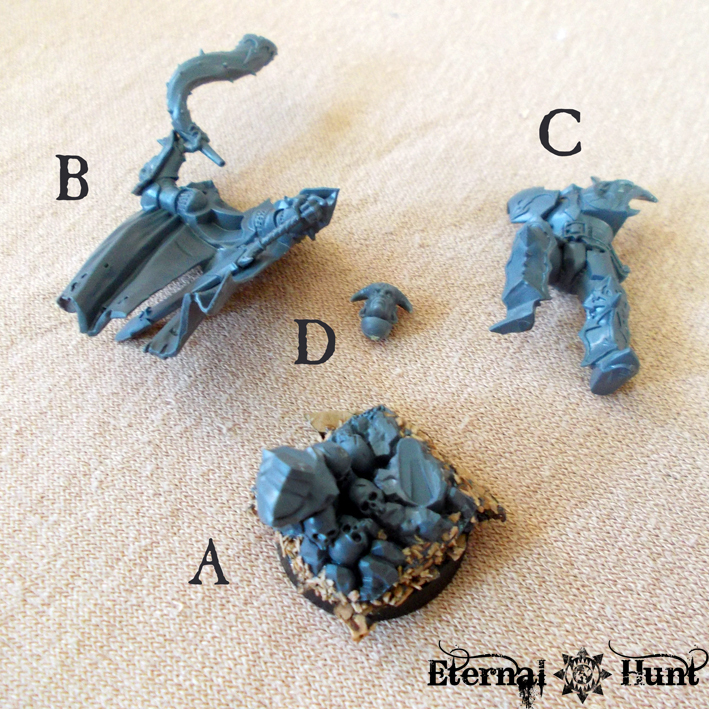 And the fact that it’s a combi-kit means that you’ll get quite a few leftover bitz: Depending on which unit type you decide to build, you get a full set of Raptor weapons and heads or Warp Talon claws and heads for your bitzbox. Nice. Here’s a piece of more substantial criticism then: I feel that some of the poses on these models aren’t all that well conceived. 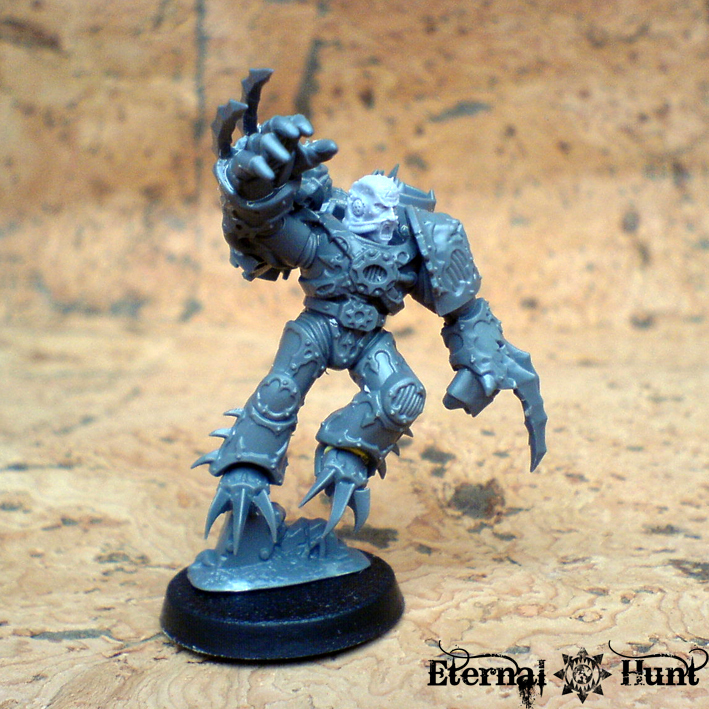 You probably won’t notice this when building Raptors, but for the Warp Talons it’s actually fairly challenging to have them look as dynamic and individual as you would like. I discovered this when I tried to go against the grain and build models that looked a little different from the ones on the box: While it’s possible, you’ll quickly discover that certain combinations just don’t work out, leaving you with a limited number of options. 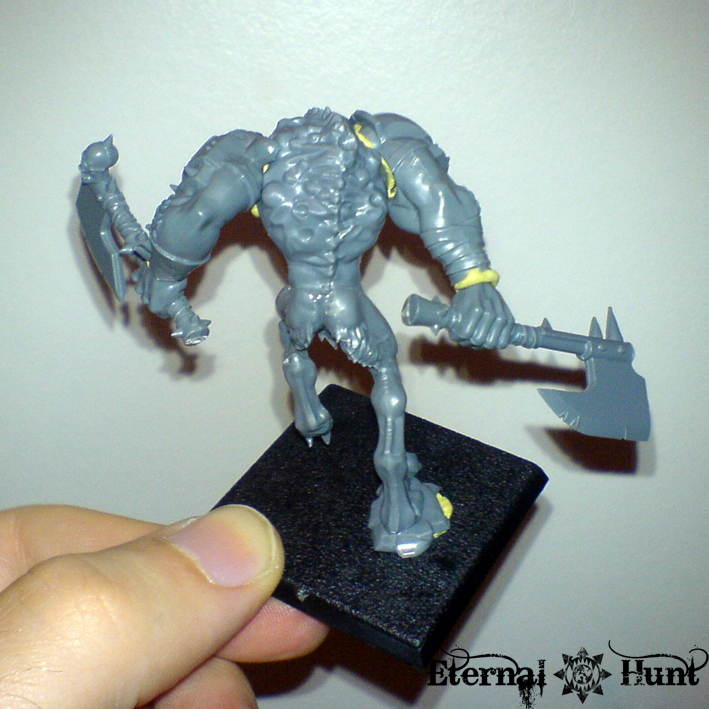 Granted, if you just want to get your models on the table, you probably won’t see this as much of a problem. 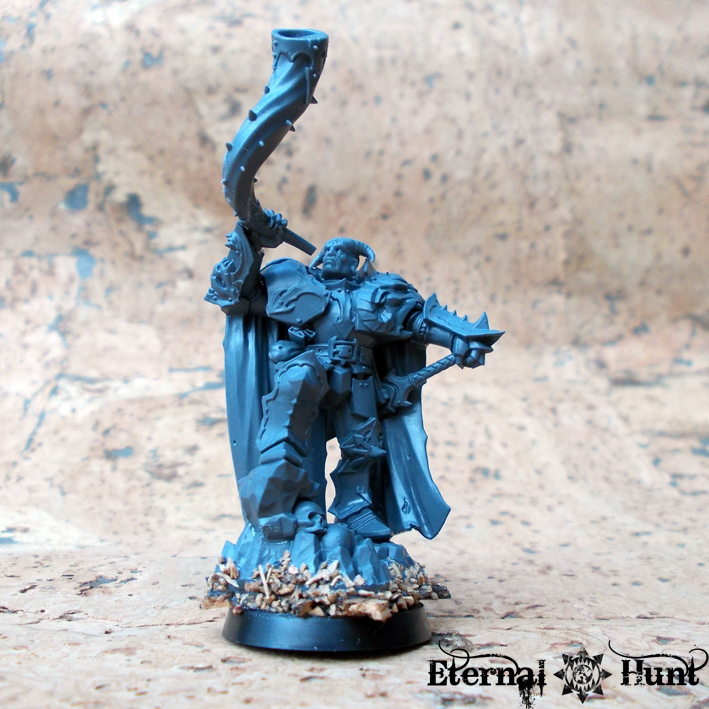 But as someone who is very much into kitbashing and converting, I cannot help but feel that these models don’t lend themselves to conversion all that much. 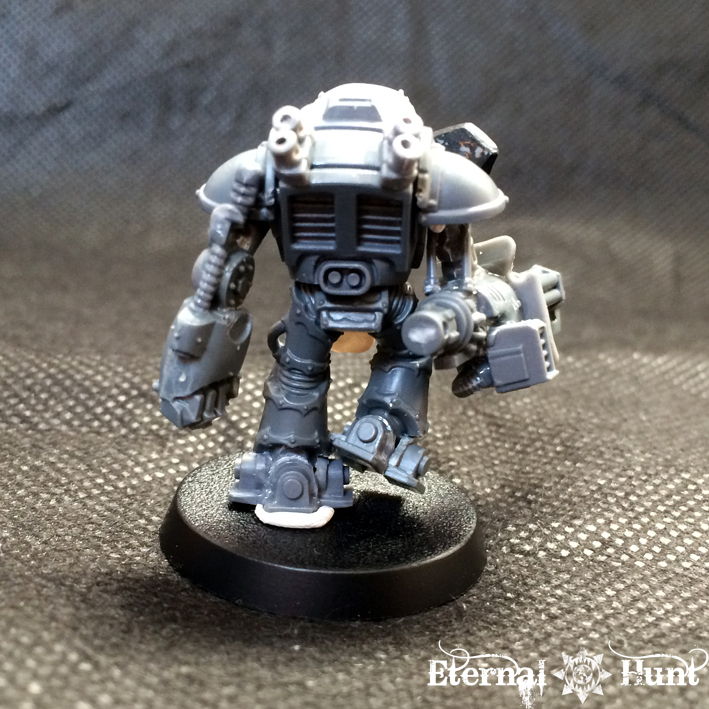 And while I like the fact that the models’ legs are attached in rather dynamic ways to small piles of rubble and battlefield debris, the designs can quickly become repetitive once you are building squads that are bigger than five models. 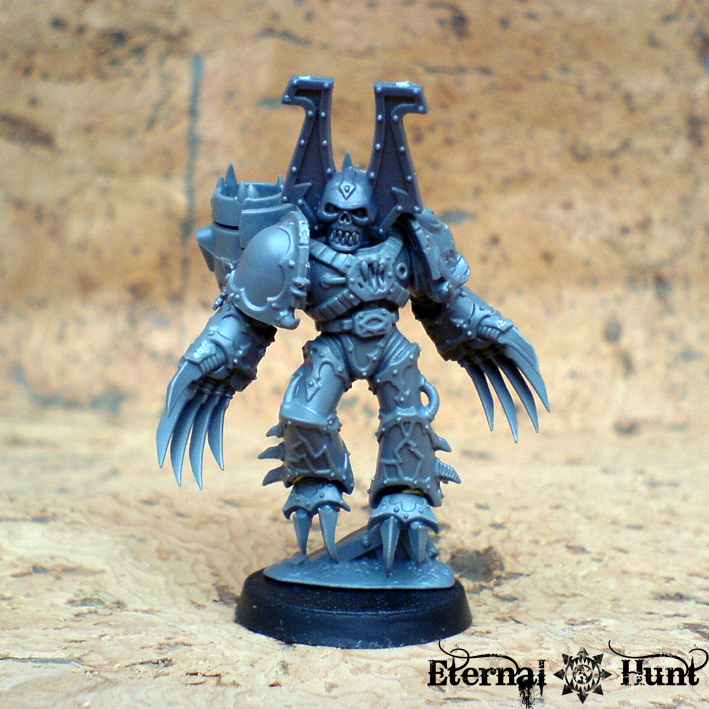 Again, this is only a matter of personal taste, but I think that the design for the Warp Talon parts is slightly weaker in some respects: Most of the heads look really clunky and slightly out of scale. And while it’s nice to get a full set of sharp talons for the models’ feet, you’ll need to do some cutting on these to make sure they look natural, instead of jutting out at an improbable 90 degrees angle. All in all, I am prepared to call this kit a success, in spite of some nitpicks. 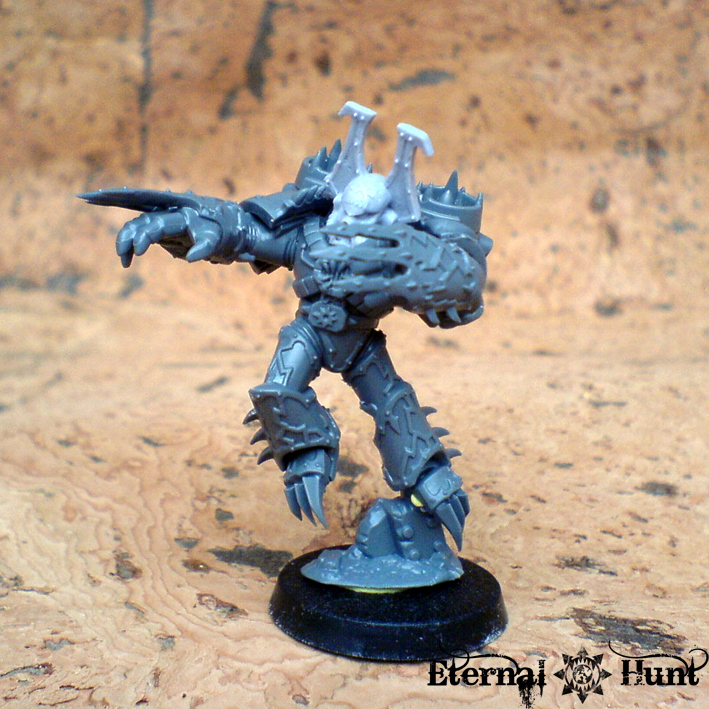 It’s is expertly designed and lets you build some great looking models for your chaos army. 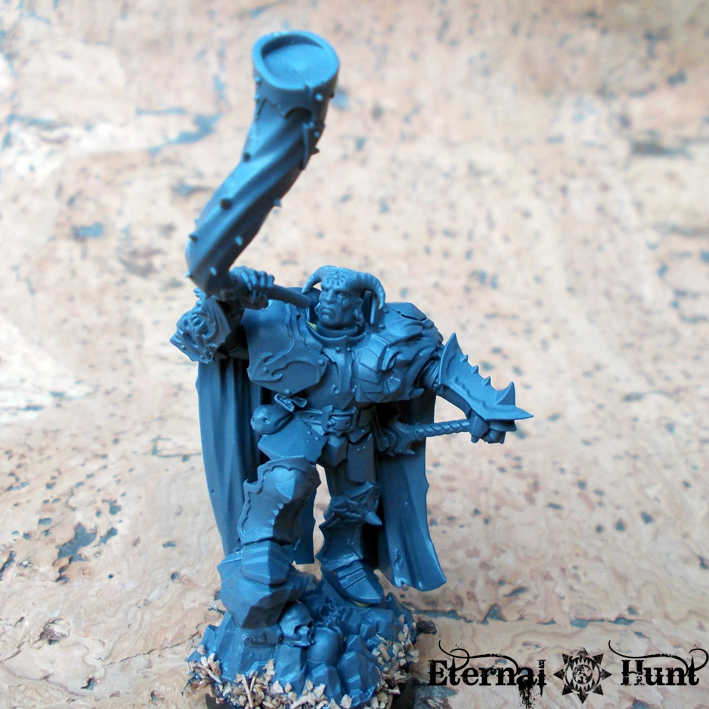 The accomplished converter will be able to work around the small problems, and you’ll be able to make those Raptors and Warp Talons look like they are actually a part of your Traitor Legion or Renegade Chapter! 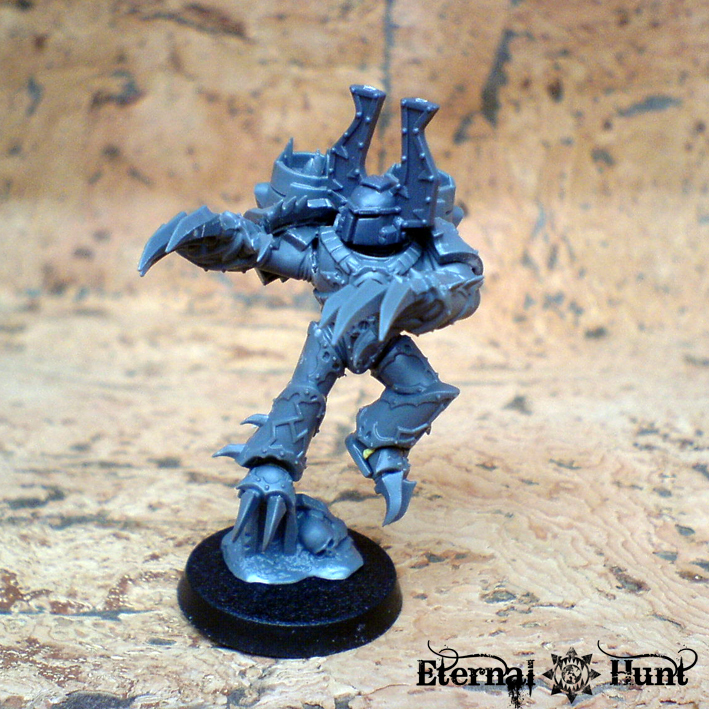 This was one of the models where the basic pose of the legs combined with the Warp Talon arms seems a little goofy. It took some dryfitting and thinking to sort things out. 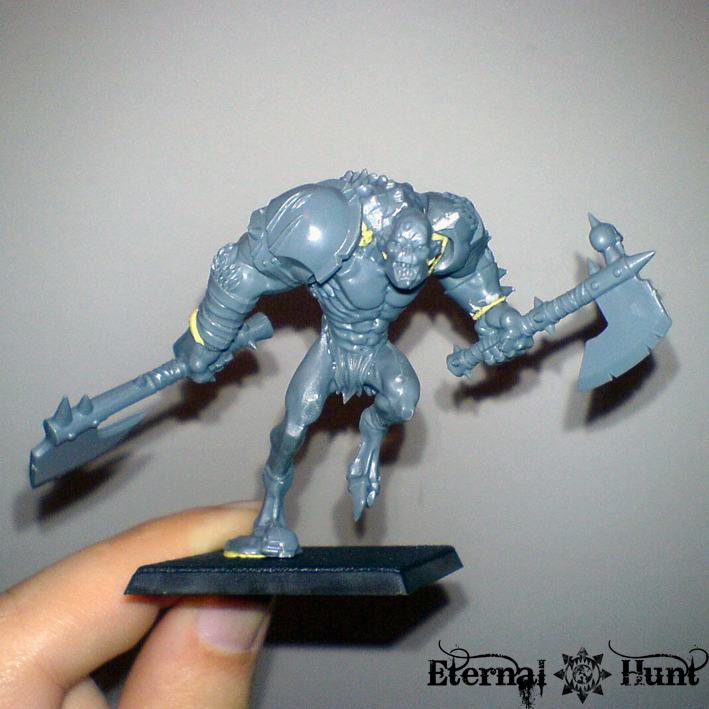 Ultimately, I am rather pleased with the model, though. In this particular instance, the feet needed a little work (I cut off a part of the soles) to make surethat the angle at which the talons connect to the feet looks natural. 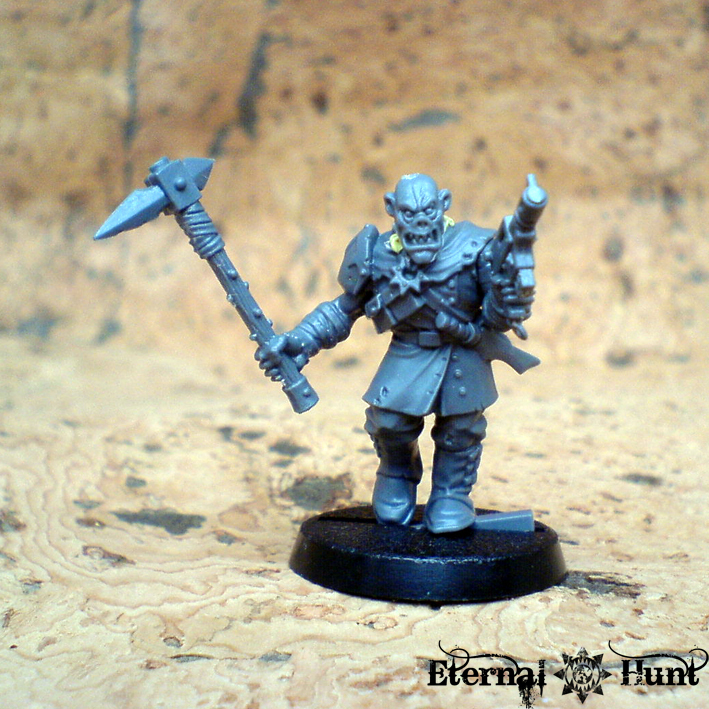 I gave this guy a FW berzerker helmet, since it added to the viciousness of the model’s look. 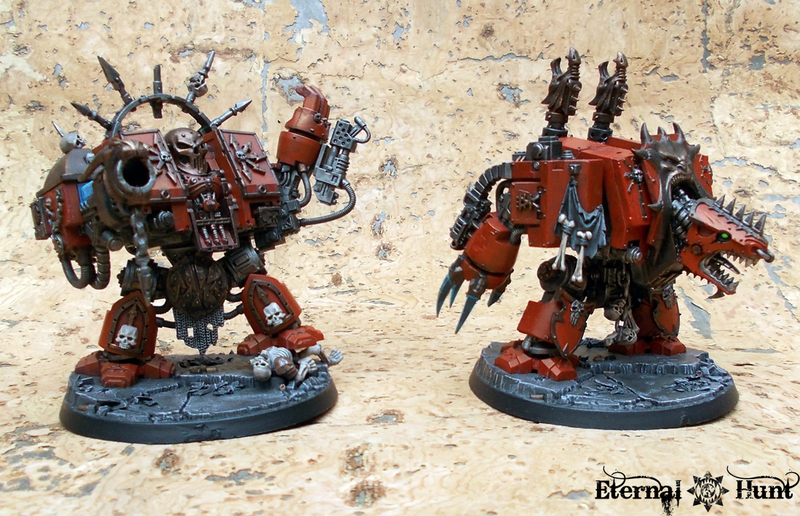 Plus I wanted these guys to be clearly recognisable as World Eaters. This second guy is the other model that took a while to get right: Although the legs are pretty cool this time, the arms are designed to be pretty close to the body, which makes for pretty restrictive posing. While I would have preferred a more open pose for the arms, the finished model shows the combination that, in my opinion, worked best under the circumstances. 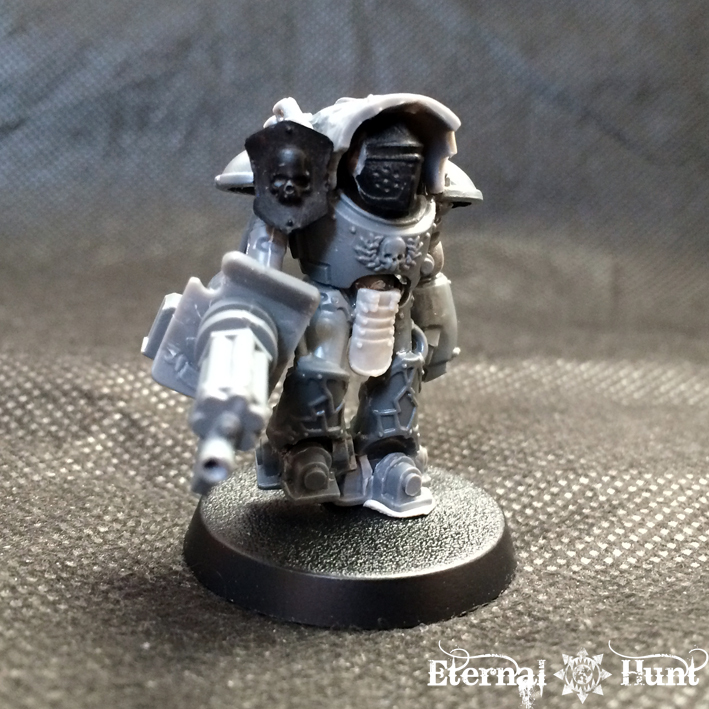 Again, I used a Khornate helmet — this time, it’s one of from the plastic berzerker kit. 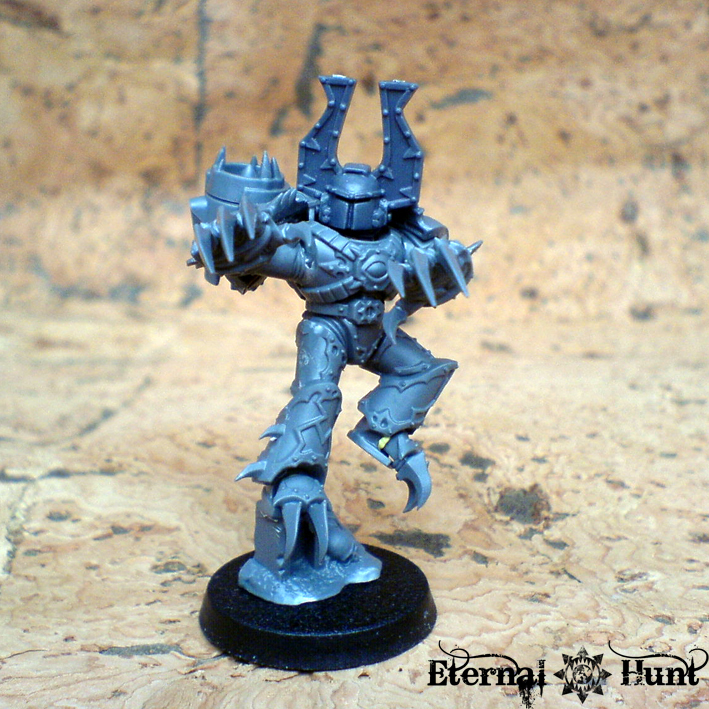 In this case, the legs and arms work very well together, creating a relaxed but quite menacing pose (not unlike the Chaos Lord with jump pack, by the way). Compared to the ‘Eavy Metal model, I changed the alignment of the torso and arms a bit, though, to make the pose just a tiny bit more interesting. And I added yet another berzerker head. I realise that many are quite tired of these, but I think in this case the head works rather nicely! I have not yet decided whether to use the “blade vanes” that attach to the jump packs. 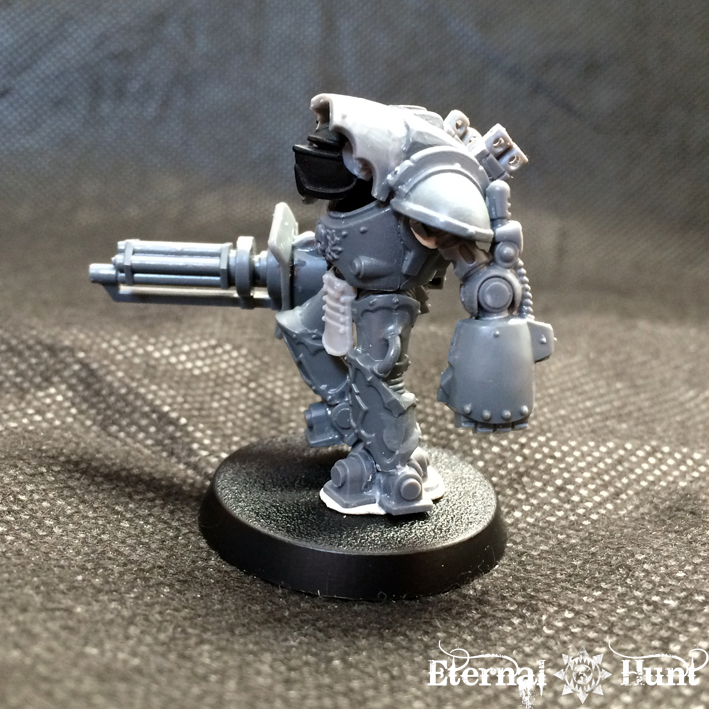 While those may seem a little silly at first glance, they could be rather useful in giving the models a more unique silhouette. Hmmm…. As you can see, the MaxMini pack looks pretty clunky by comparison, while the new model’s silhouette is far less bulky than you would have suspected. 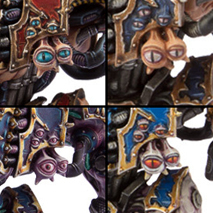 So, one last question remains: Raptors of Warp Talons? The Raptors you can build from this kit will work great out of the box, with very little extra work required. 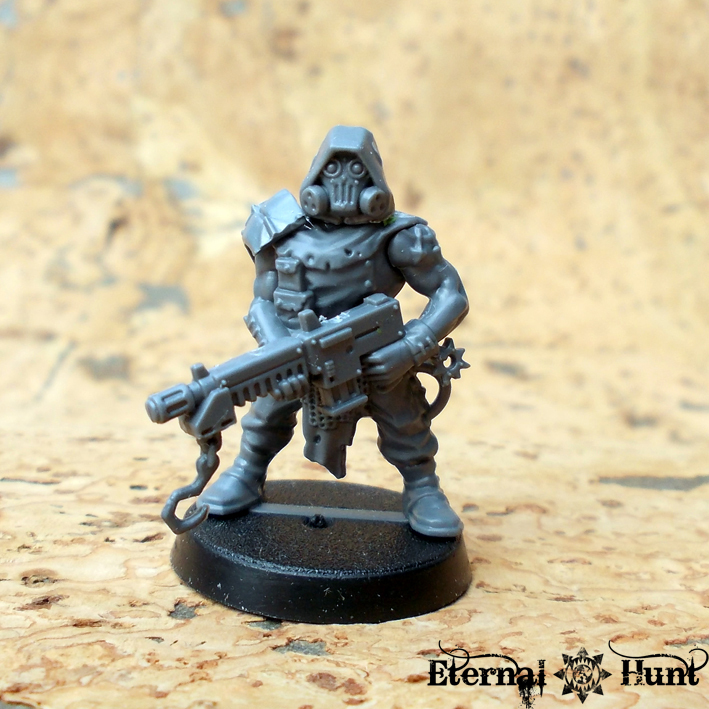 You get lots of options, and the squad can be made to look like a external cult or like your own Traitor Legion’s dedicated jump infantry. 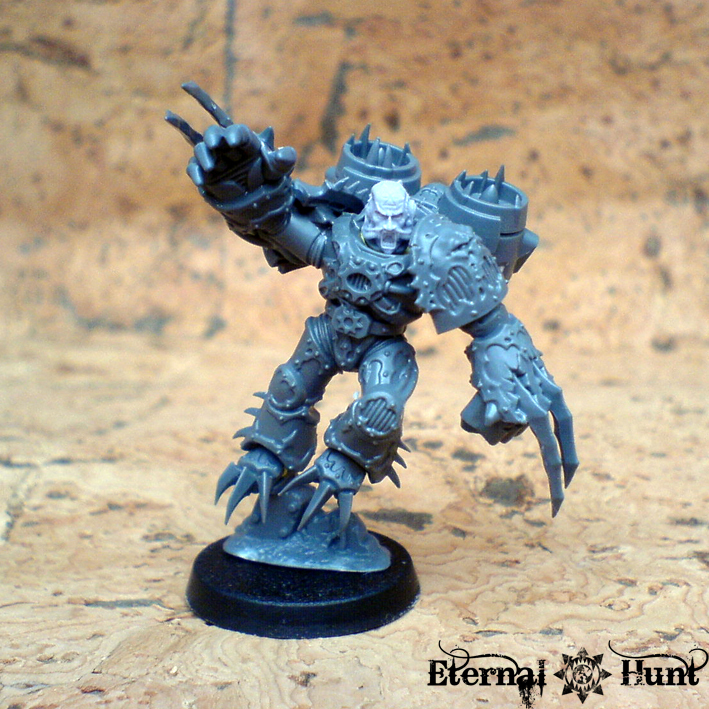 They’ll also look good alongside your older models, even though they may be a bit more detailed. 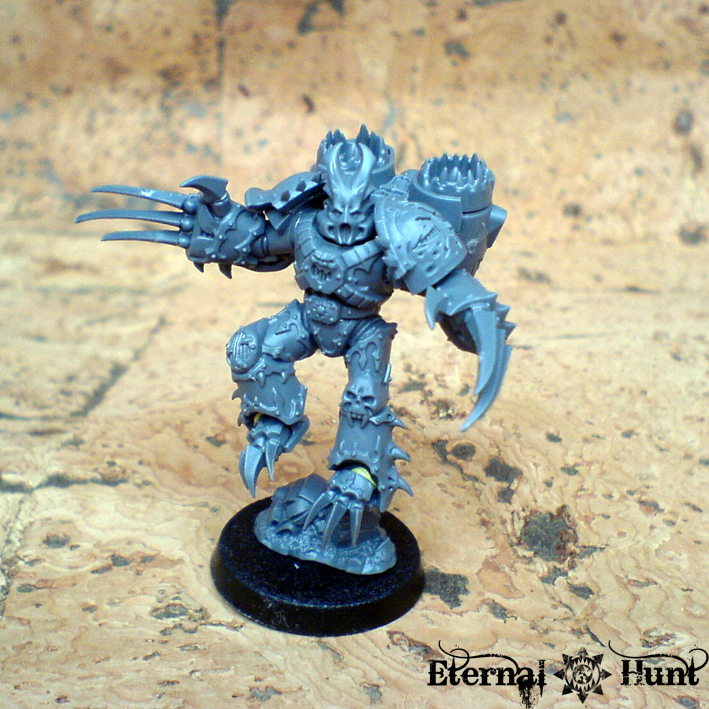 The Warp Talons suffer from their rather restrictive poses and will need more work and maybe an influx of external bitz to truly make them shine. Still, their rather distinct silhouette and overall look make them visually interesting, and those clawed gaunzlets are really great. 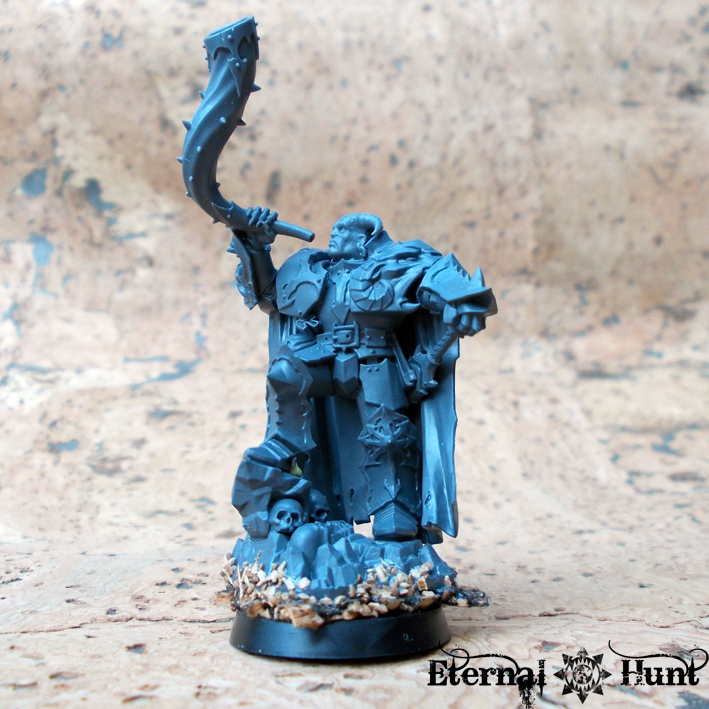 They are also a great modelling option for Night Lords, in my opinion. In any case, quite a nice kit that gives you a lot of options. The smaller drawbacks shouldn’t keep you from giving this kit a try! 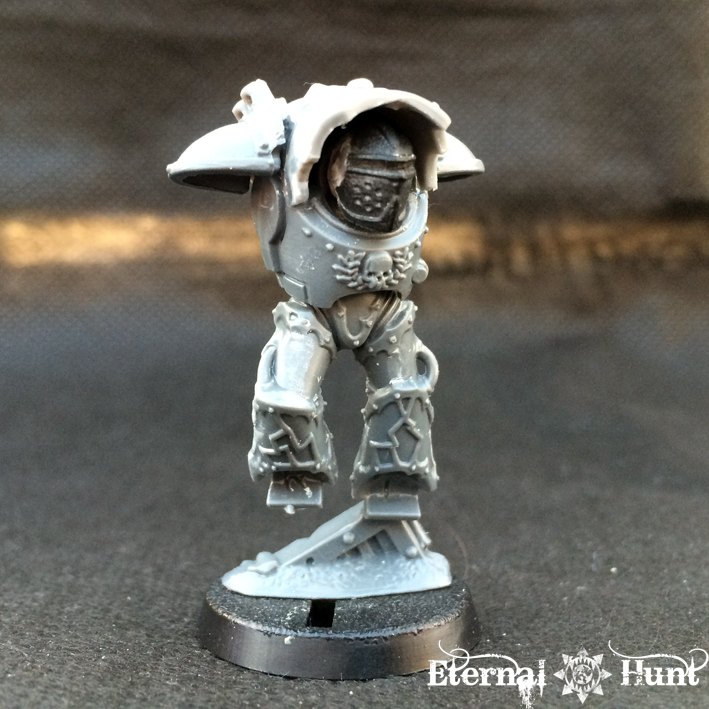 Do you have any thoughts on the kit or my first test models? I’d be glad to hear them in the comments section! 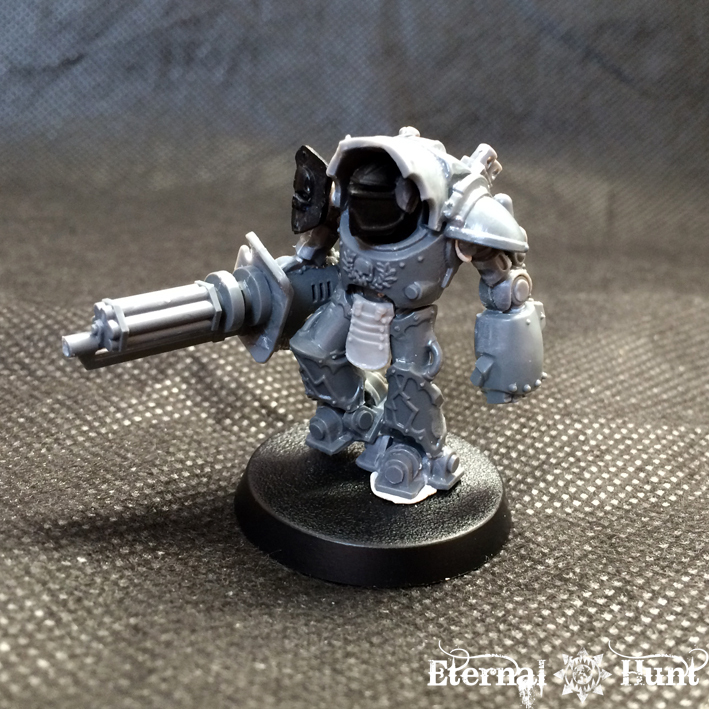 But while he may be a backstabbing, pointy-eared torture-freak at heart, Andy couldn’t help but feel a certain fascination with the new Codex: Chaos Space Marines. 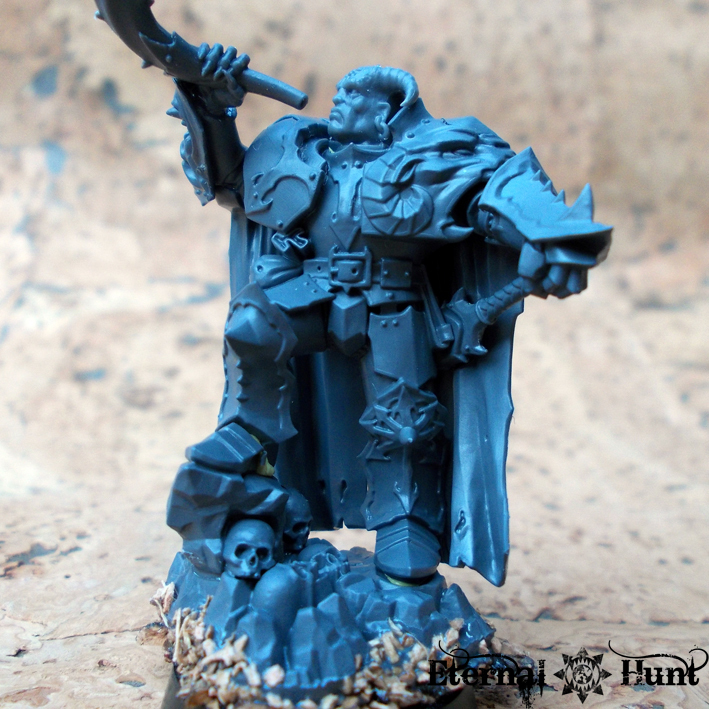 So all of a sudden, some CSM models cropped up on his desktop. And now he’s seriously looking at assembling a small chaos army. Today’s post will be about the first results of that plan. 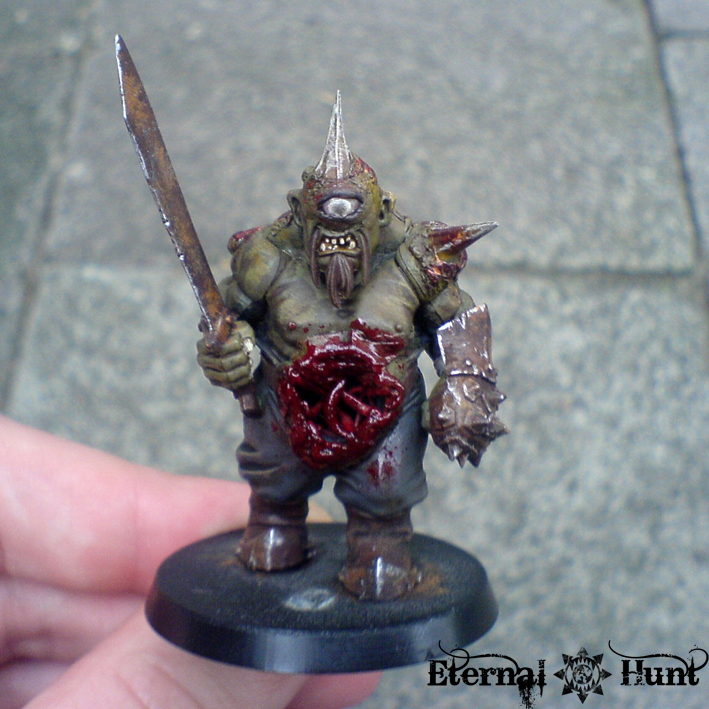 First up, one of the test models for his new paintjob: A Plague Marine of Nurgle. 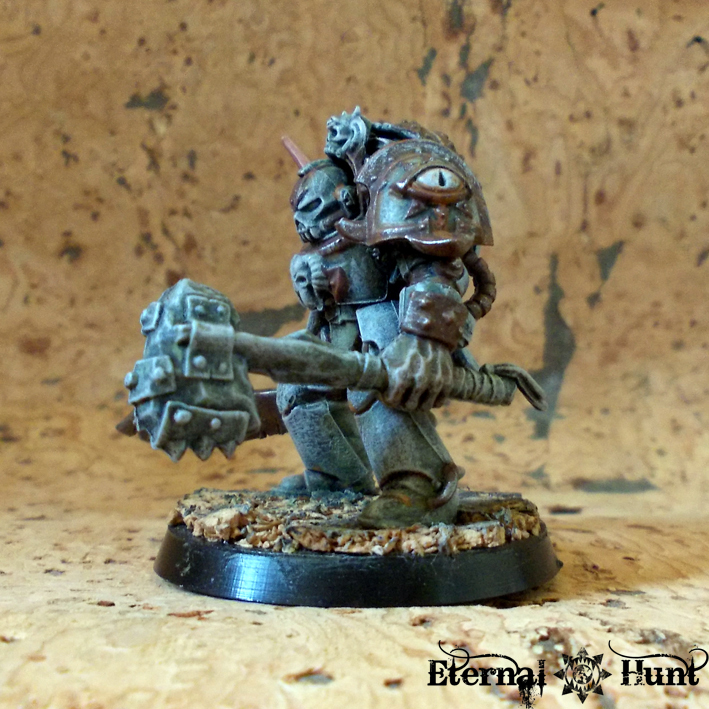 Andy devised a very simple recipe for the basic armour colour: Overbrush a black undercoat with GW Gretchin Green, then drybrush that with GW Dheneb Stone. 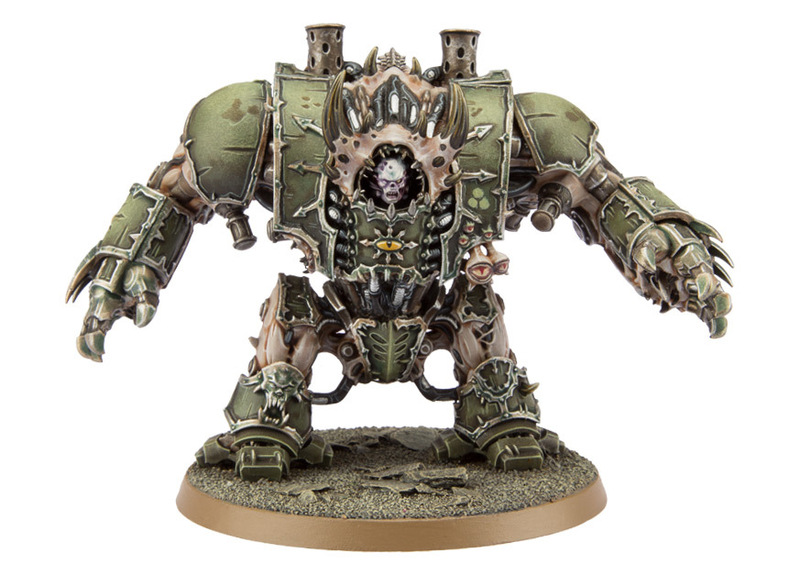 The resulting colour looks slightly green and instantly reads as Death Guard, if you ask me. 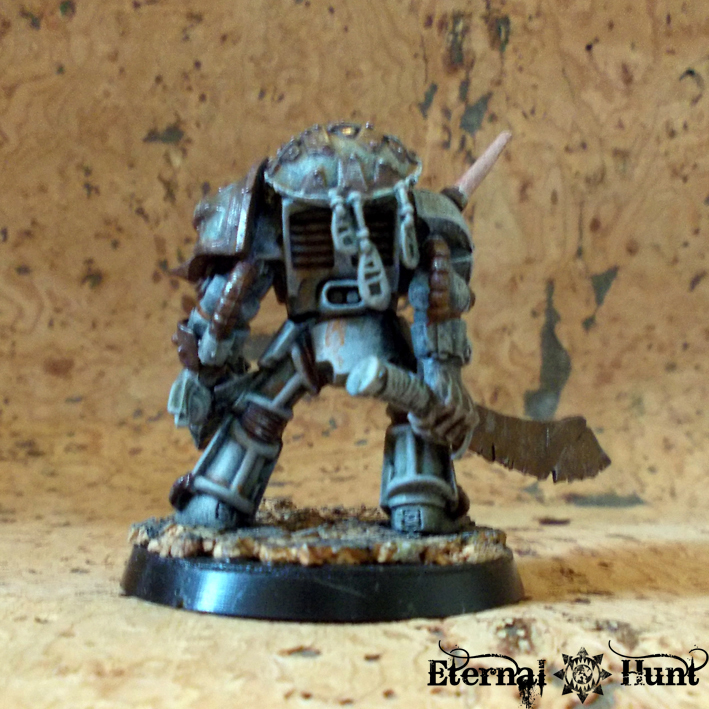 The armour trim was blocked out in rusty metal, and some additional rust was painted into the deeper recesses, using thinned down GW Vermin Brown. While some of the detail could still profit from a bit of additional attention, I think you’ll agree that the overall colour scheme is pretty effective already. 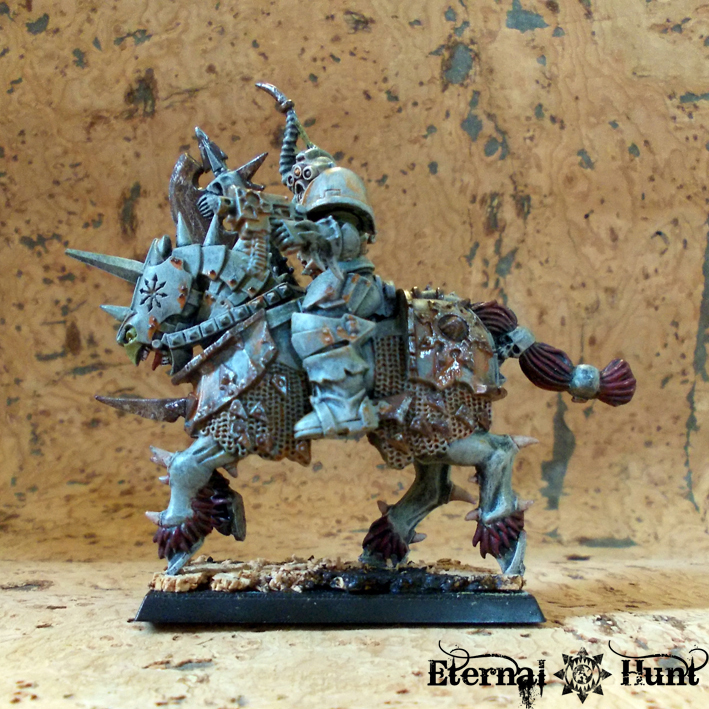 And the very medieval look of the horses is a rather nice fit for a Nurglite army, if you ask me. 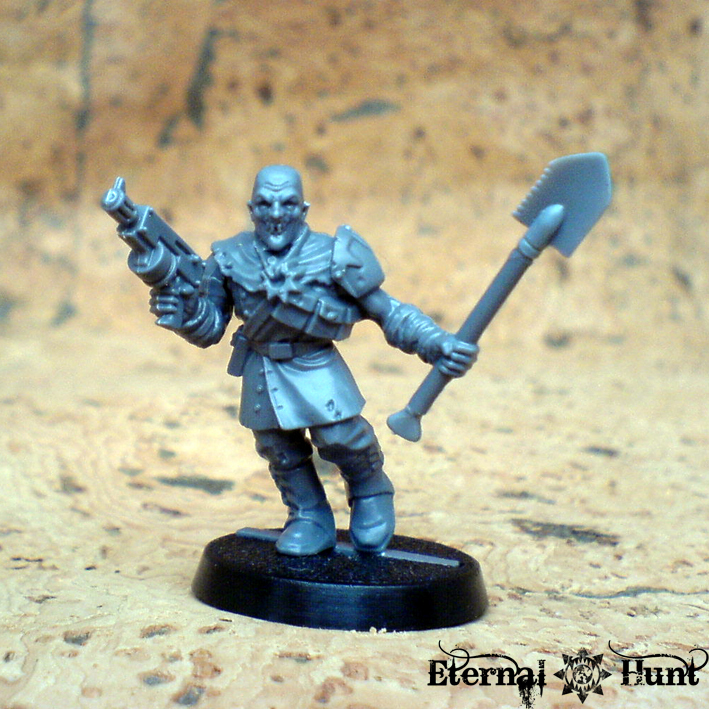 Knowing his usual conversion work, I imagine the finished squad will end up looking rather disturbing — in a good way! I, for one, am pretty interested in seeing where this is going! More on this as it develops. 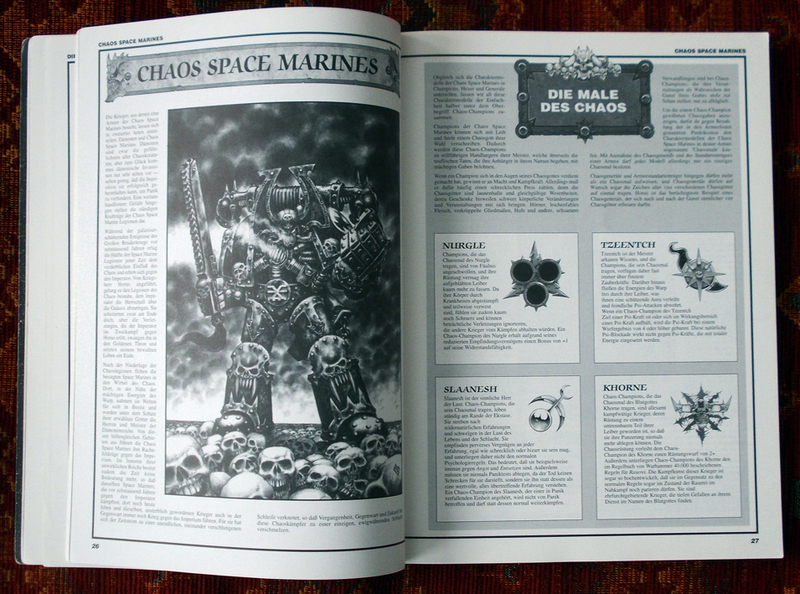 The new Codex: Chaos Space Marines has been with us for a while now, and I have spent quite some time browsing through it. It’s a beautiful book, to be sure, with all of the flexibility I liked about Gav Thorpe’s oft-maligned last edition codex coupled with some of the flavour everybody enjoyed about the 3.5 book. It also adds some new and quite individual selections that players can add to their force to make it more different from loyal Marines. It also murders a few darlings (*cough* champs with power fists *cough*), but that was to be expected. 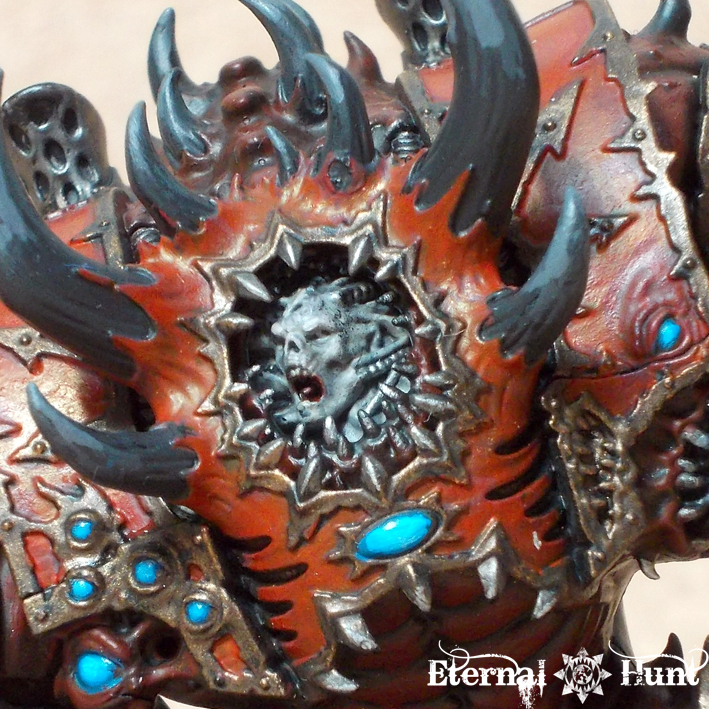 Granted, I couldn’t really tell you how thinks are looking on the tournament front, but then I couldn’t care less either: From a casual gamer’s perspective, there is a lot to like about the codex. 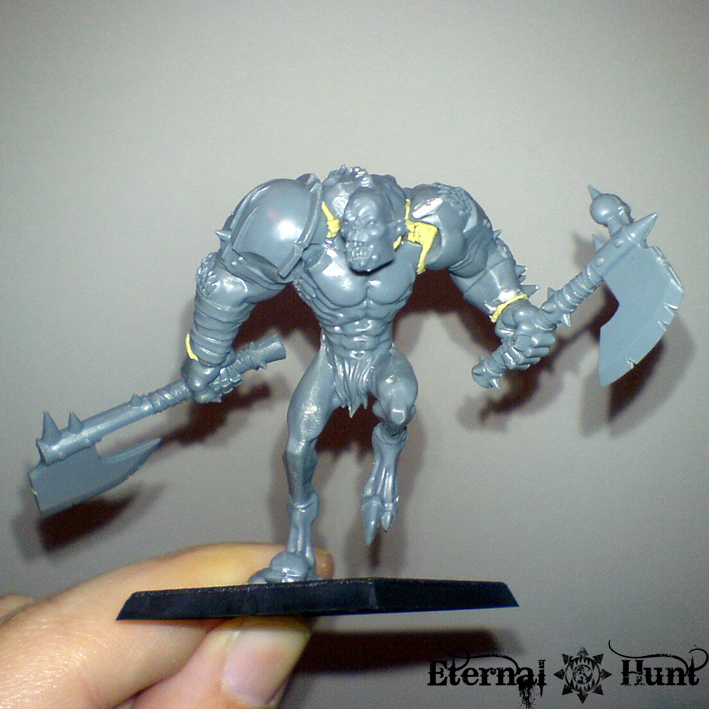 With assault becoming a little trickier in the new edition, fast units are now an even more interesting proposition. 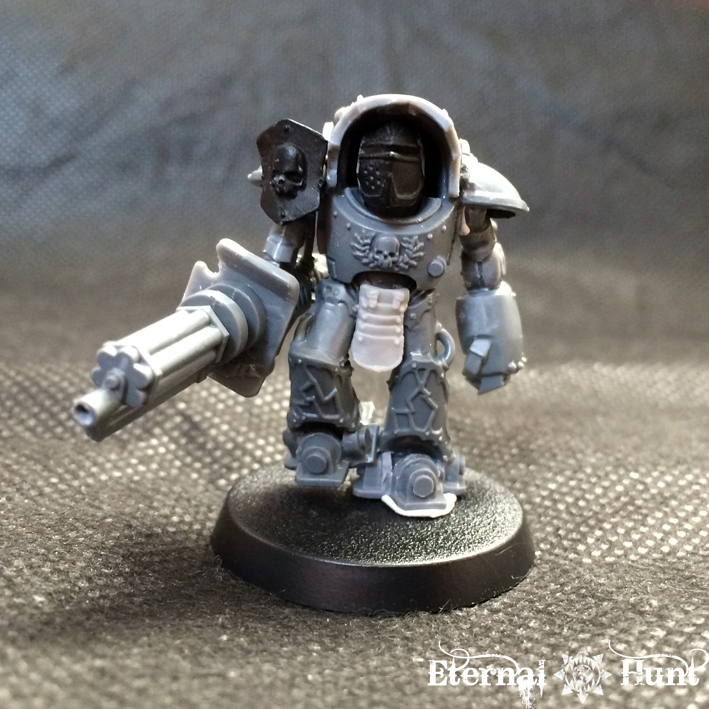 The first way to make your army that much faster is the use of jump infantry, and considering my well-documented soft spot for Raptors as well as the fact that they received both a reduction in points as well as a spiffy new plastic kit, this is an avenue that I consider exploring to its fullest. So expect a closer look at the new Raptor/Warp Talon kit shortly! 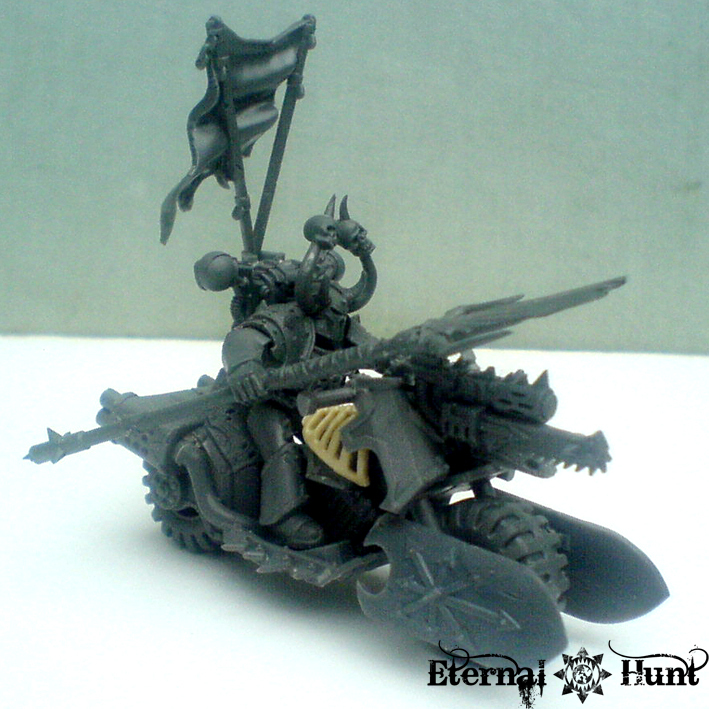 The other available option for more speed would be to add some bikes to my army. With a hefty reduction in points cost and a couple of nasty rules, bikes seem to be one of the winners of the recent update. I wouldn’t even have to start from zero, since I already have three bikes that I picked up as part of a huge army deal some time last year. 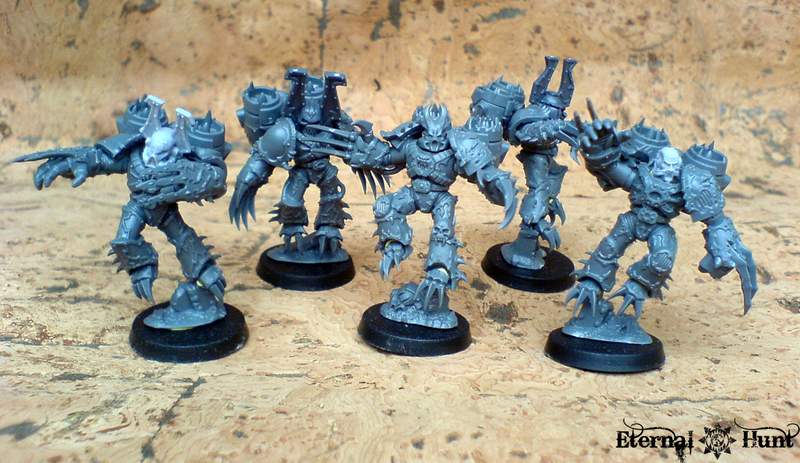 They are already converted and ready to be painted. Unfortunately, those three would need quite a few additional buddies to be truly effective. And while the option of getting into combat really fast does, of course, appeal to me, I feel a little apathetic about building and painting a lot of bikes — especially now that the box containing three of them is no longer available. 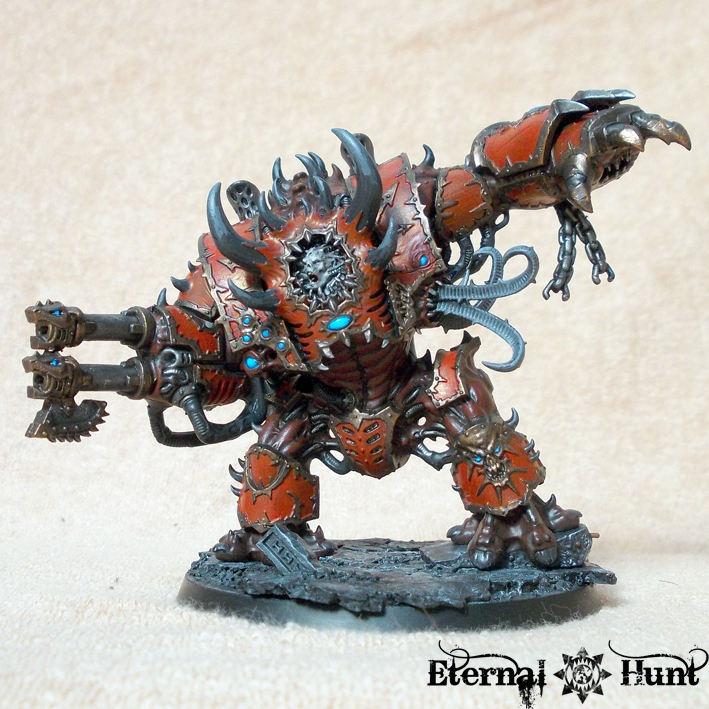 I really want to add some Daemon Engines to my army! 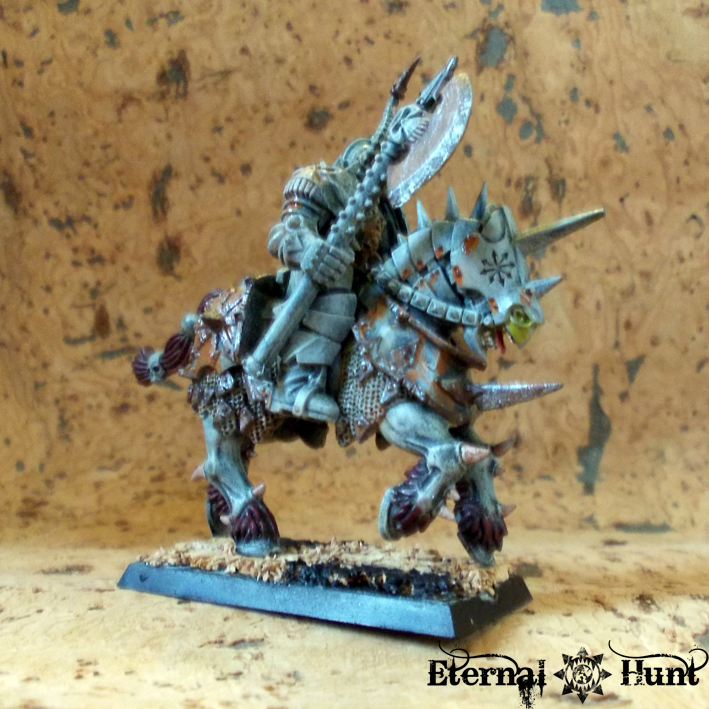 And since I know my own lack of discipline, I used the Eleventh Throne of Skulls Painting/Converting Contest to help my resolve: You see, having won the last contest, I get to choose the next subject. 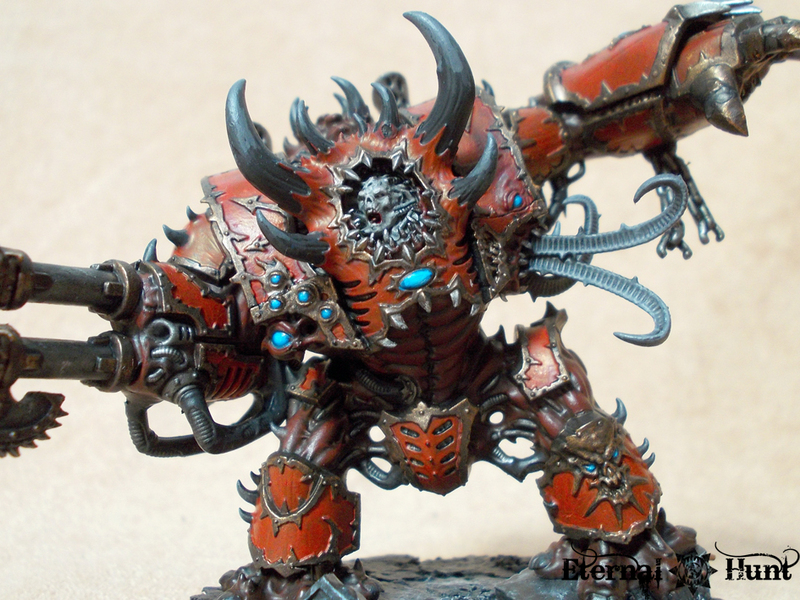 So I chose Khornate Daemon Engines to basically force myself into building and painting one in the near future. 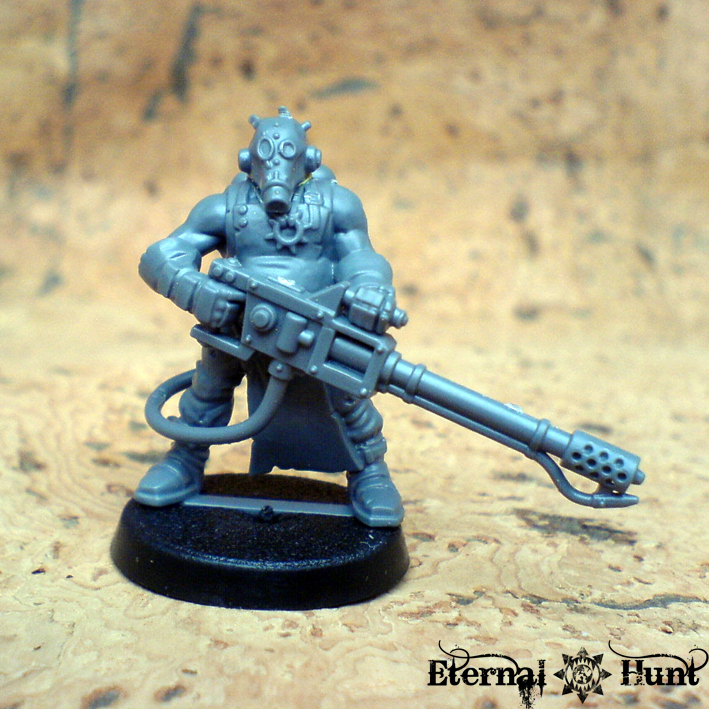 Well, from an avid converter’s perspective, the award for the least interesting unit types goes to the Obliterators and to their more CC-oriented kin, the Mutilators. 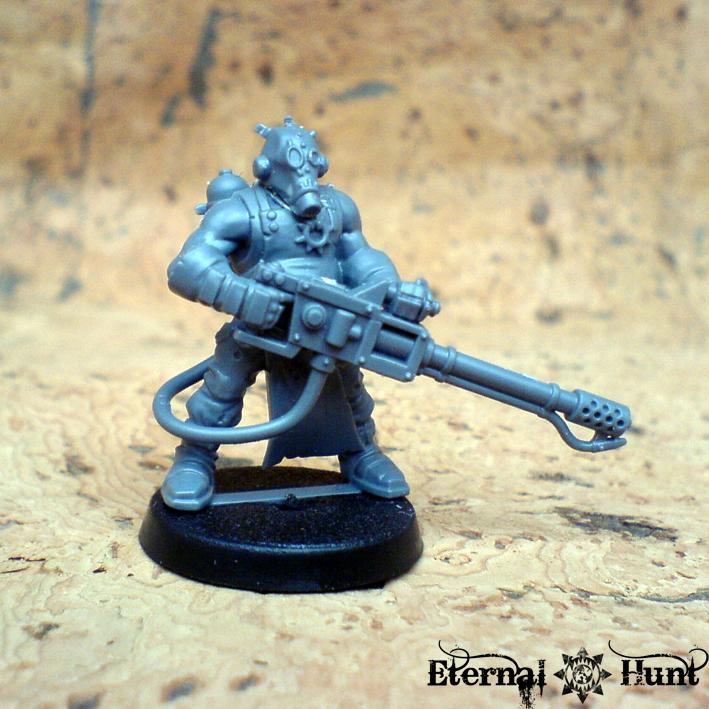 With the official models still so very ugly, I was actually rather stoked for a while at the prospect of converting my own version of the Mutilators, with a look more in line with my own aesthetic preferences. 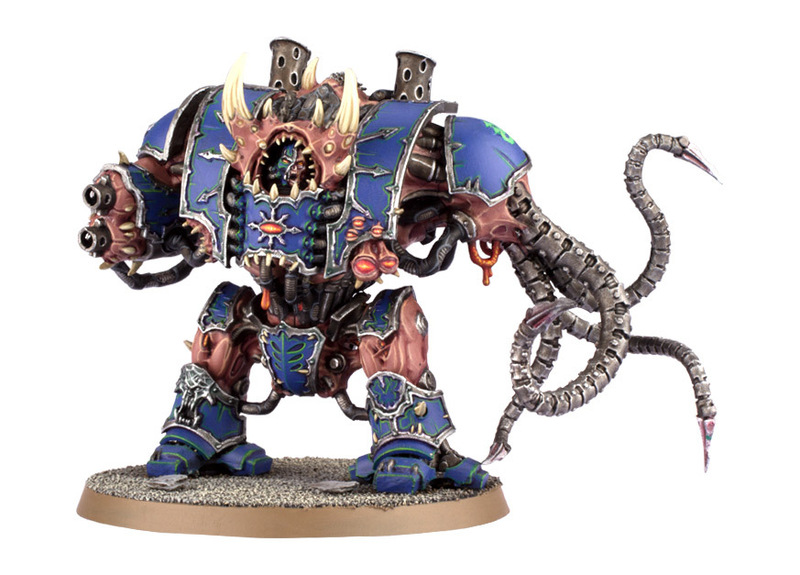 But seeing as the rules are just as lacklustre as the models, I have redirected my modelling efforts in this respect towards another project (see below). 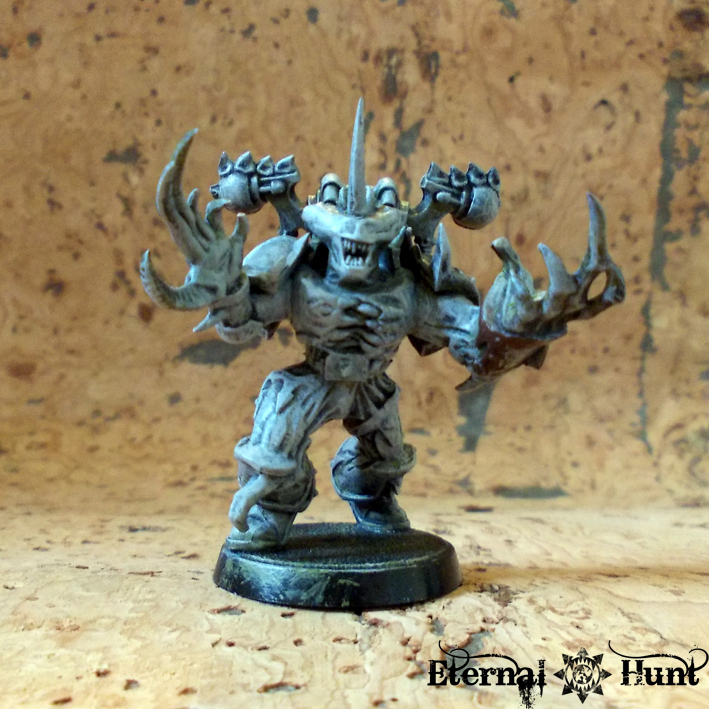 And I am still happily plugging away at the remaining contents of the Dark Vengeance box: For instance, I worked some more on the models I already showed you some time ago. 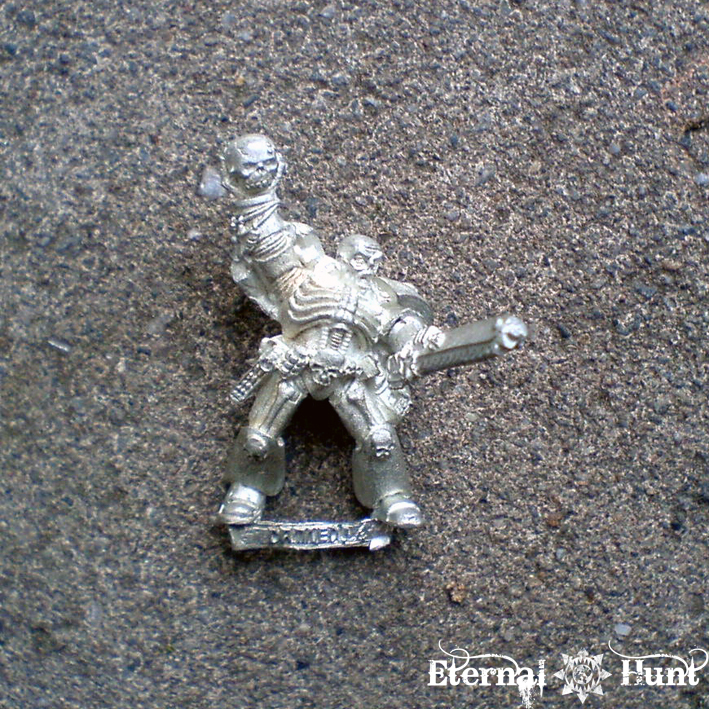 This guy received some impromptu head surgery as an addition to the added icon. 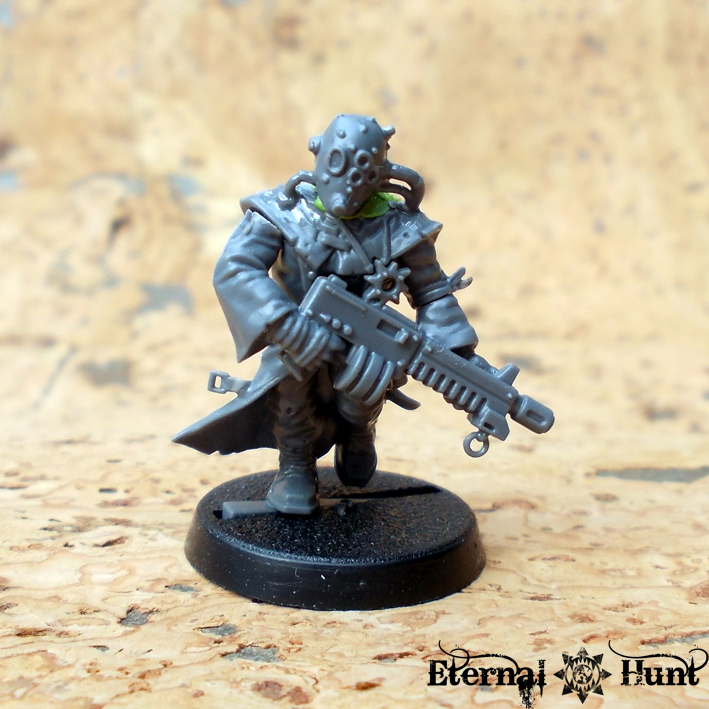 I also wanted to change the look of the cultist wielding the flamer, and what better to use than a head sporting a gas mask? 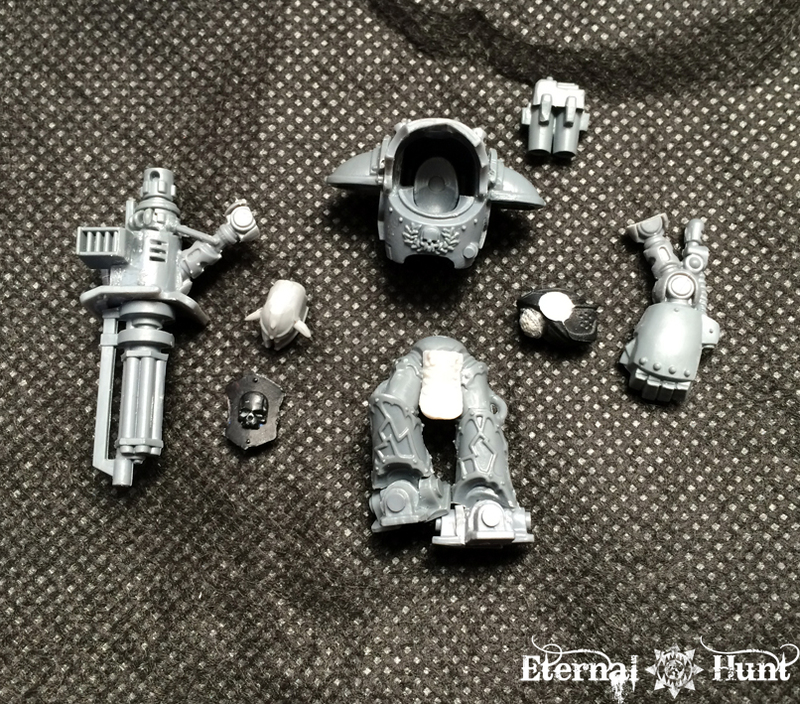 Meanwhile, the head’s original owner received a replacement courtesy of the Crypt Ghoul kit. While the head is a rather nice fit, I’ll still need to use some GS to build up a neck portion. 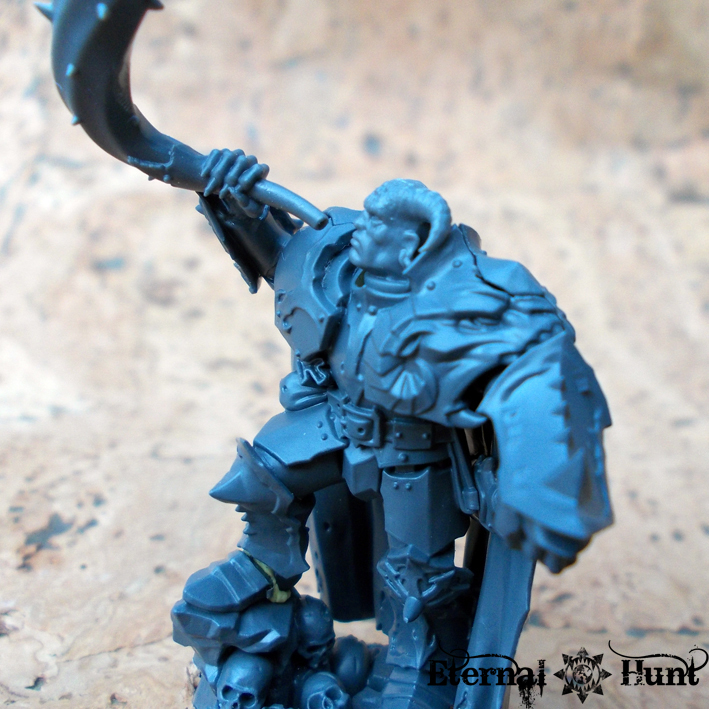 I also added a new CC weapon, originally from the WFB Chaos Marauders. The weapon nicely fits the “repurposed tools” look, though. I really didn’t want to cut off this guy’s head, seeing how that would have created a huge, damaged area to take care of. So I just added a Marauder shoulderpad and a small bayonet to his gun and called it a day. 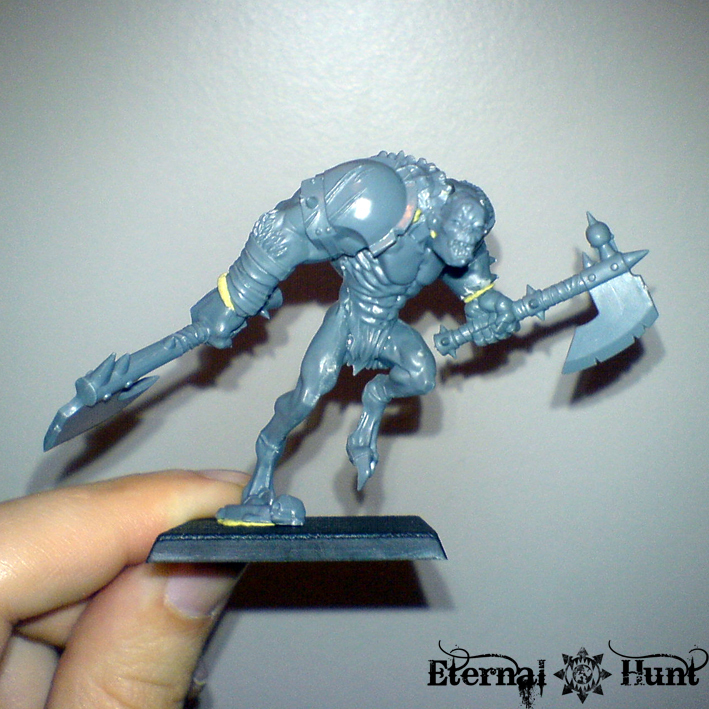 I am pretty confident that I’ll be able to make his paintjob look different enough from that of his “twin”, though. I also added another amour plate and a small chain dangling from the barrel of the autogun. 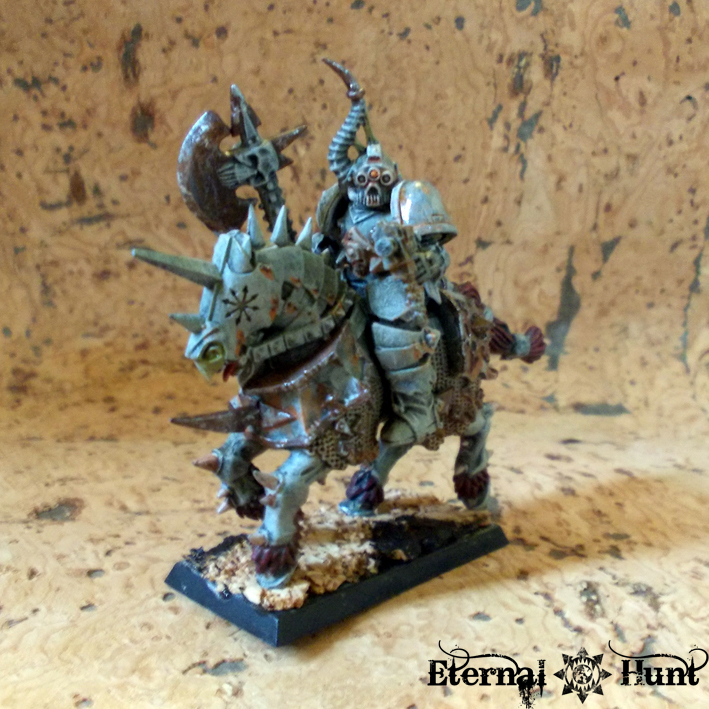 I did a rather subtle conversion on the model’s right arm, replacing the original axe (and the hand holding it in a rather infuringly awkward way) with a weapon from the WFB Marauder Horsemen. 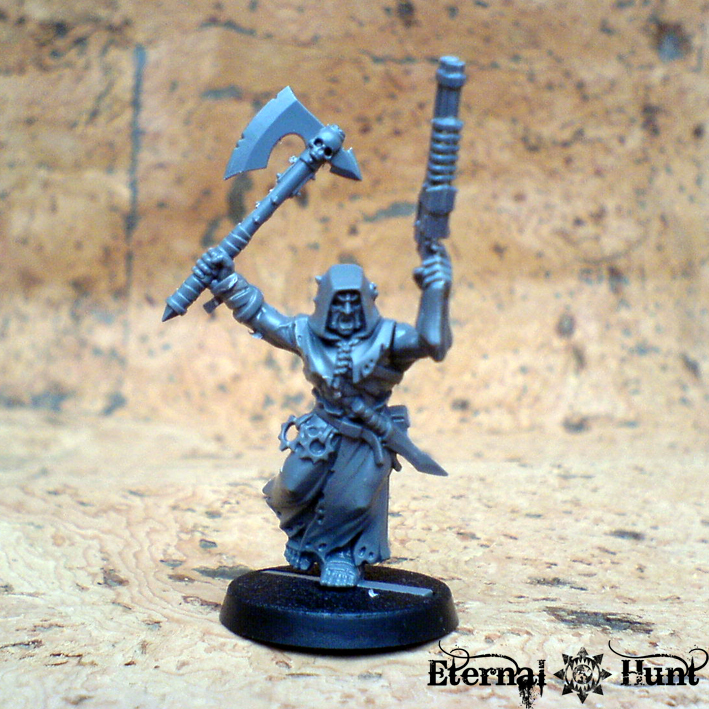 The left forearm was replaced with that of the other cultist champ. 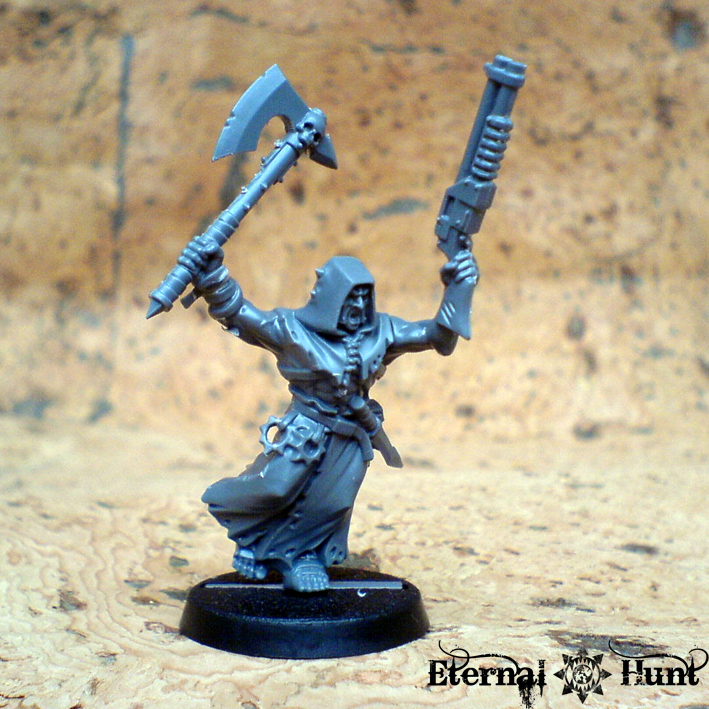 I think this guy with his disheveled zealot look looks rather convincing wielding a shotgun! The menacing clawed gauntlet went into the bitzbox for a future project. a squad of Chosen I built some time ago. 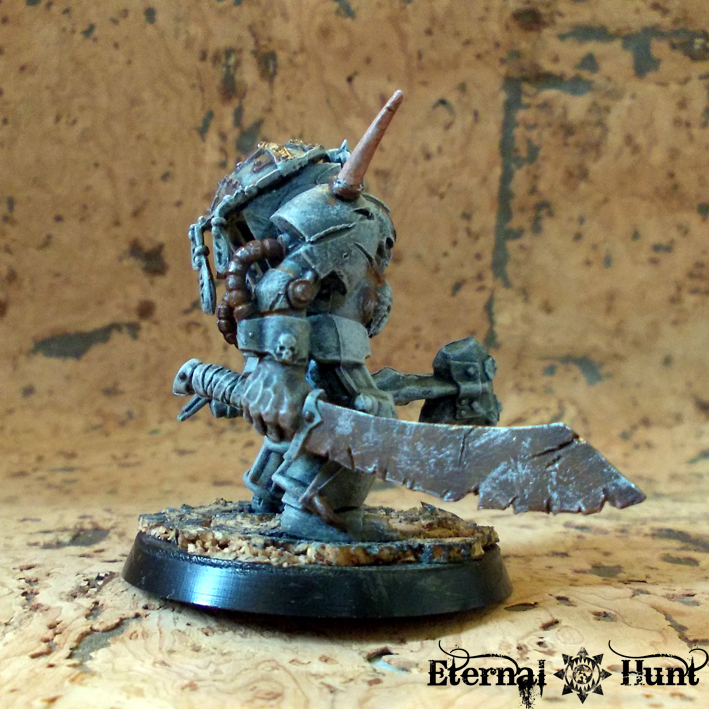 While they may lack the fantastic detail of the Dark Vengeance Chosen, they are a rather nice fit for my army fluff. 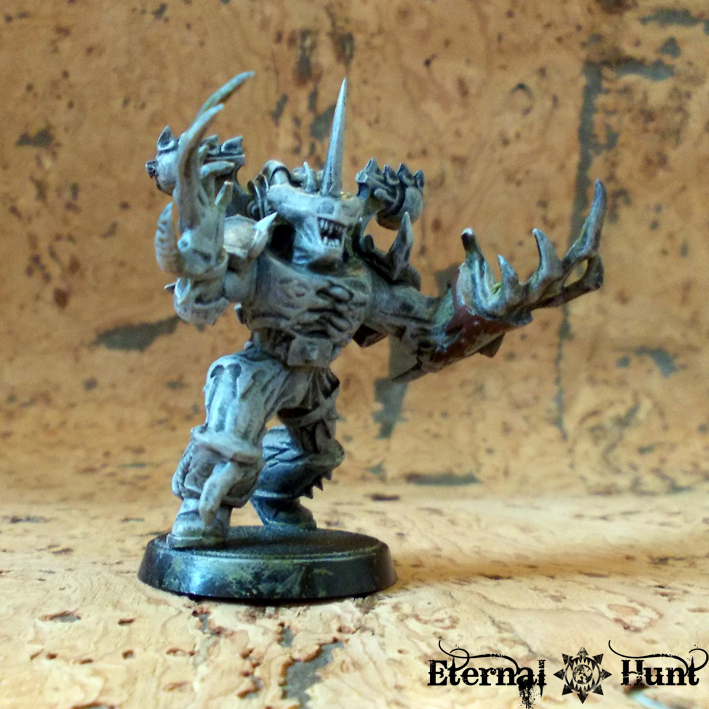 a couple of unpainted Lords, in keeping with my addiction to converting Chaos Lords. 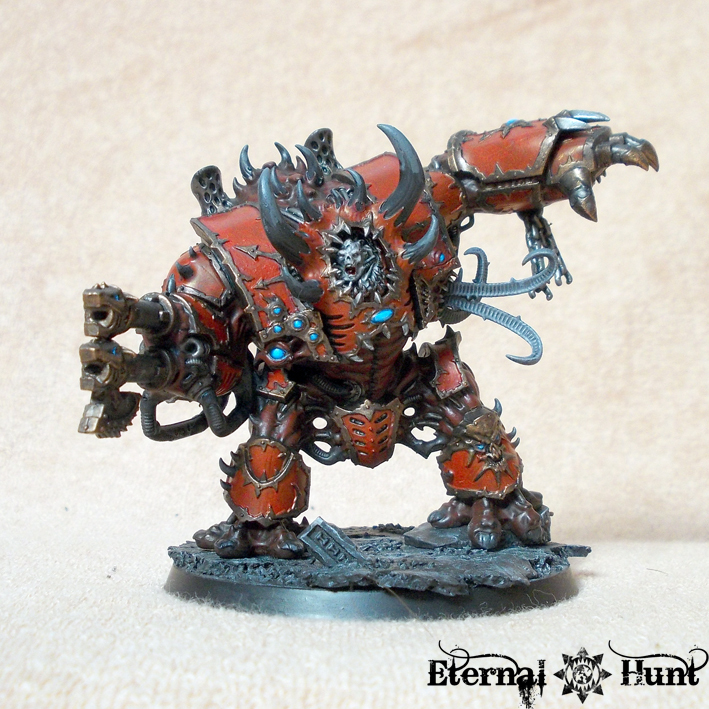 First up is what may be my favourite metal World Eater ever. It’s hard to believe how crisp the detail on this guy looks, especially considering the model is from 1990! That’s vintage Jes Goodwin for you! 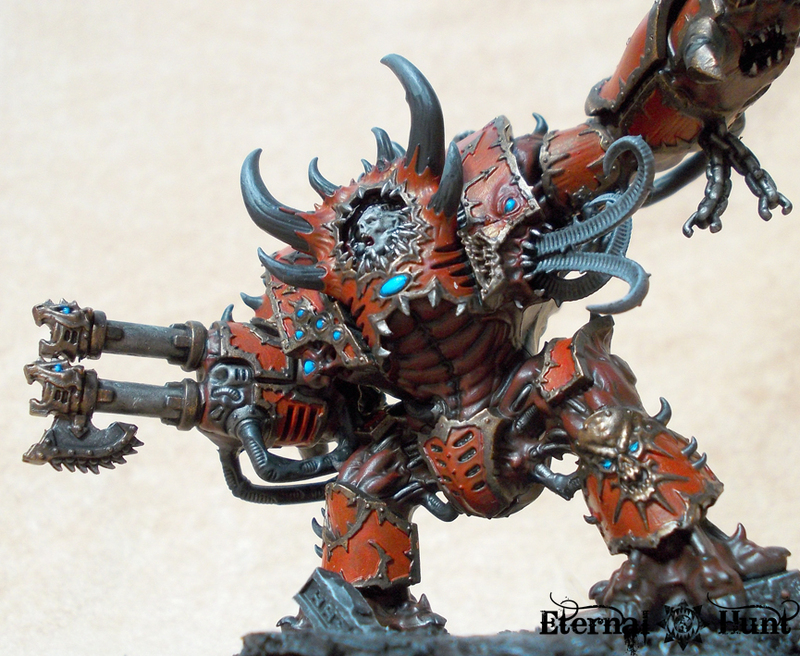 It looks much cooler than some of the more recent metal World Eaters. 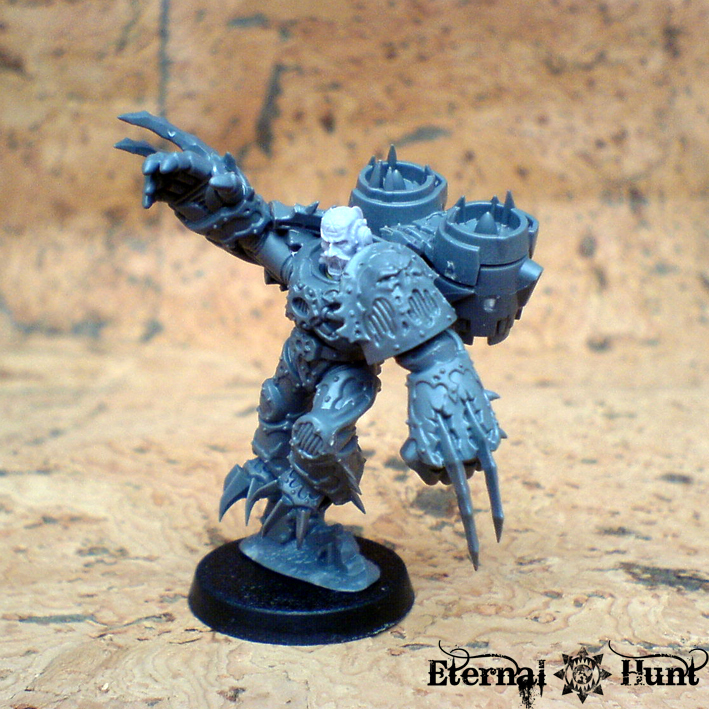 In fact, my only nitpick would be the slightly hunched pose. Apart from that, this guy is damn near perfect! 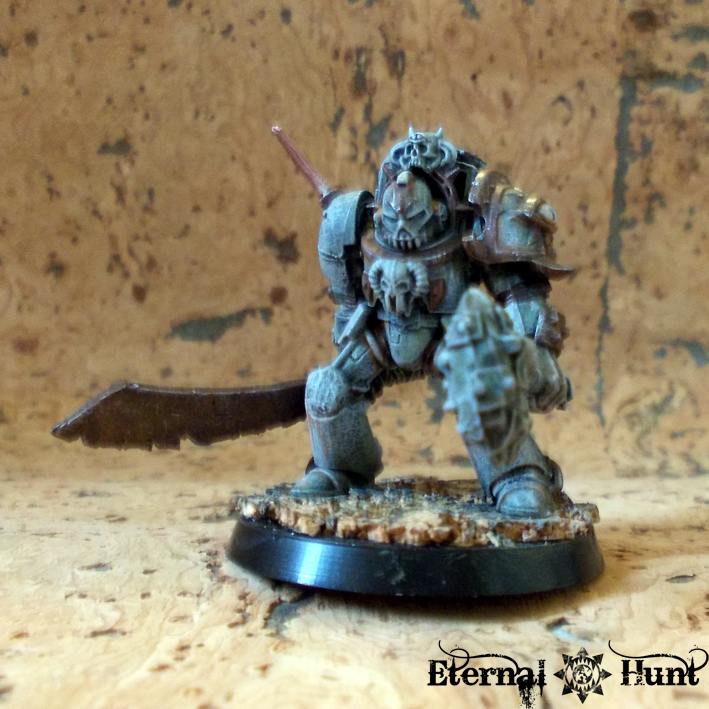 That’s right, a complete Legion of the Damned Sergeant Centurius! 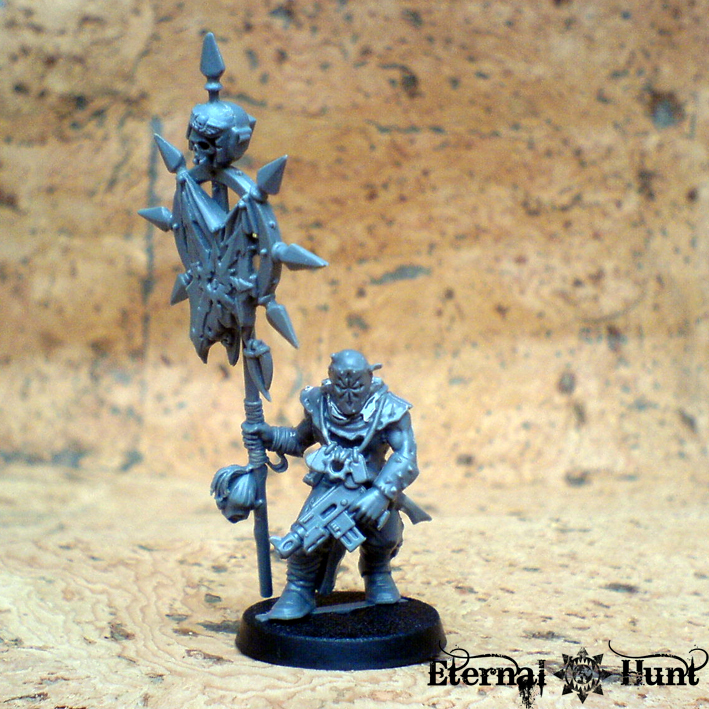 Now I am a little torn about this model: Should I leave it as it is and paint it in its “intended” colours, or should I make it into a skull champion and induct it into the ranks of Khorne’s Eternal Hunt? As you can see, I have a lot on my plate right now. So expect a slew of chaotic updates! Yay! And let me know your opinion in the comments section!